I find love in the little things. It’s in little notes left on windshields, a small gesture to get hair out of a face, a snack ready-made when an arrival is imminent. That’s it. It’s huge. Beautiful, but huge. And kinda reminds me of the love fern from How to Lose a Guy in 10 Days. But it was thoughtful of him and I love it. What did I have in return for him? A slice of this bread with a thin coating of peanut butter on top. We had plans to make dinner together but on the phone prior to his arrival he noted his current state of starvation. I knew just what to do. I had made this bread over the weekend while he was gone and knew he would love it. 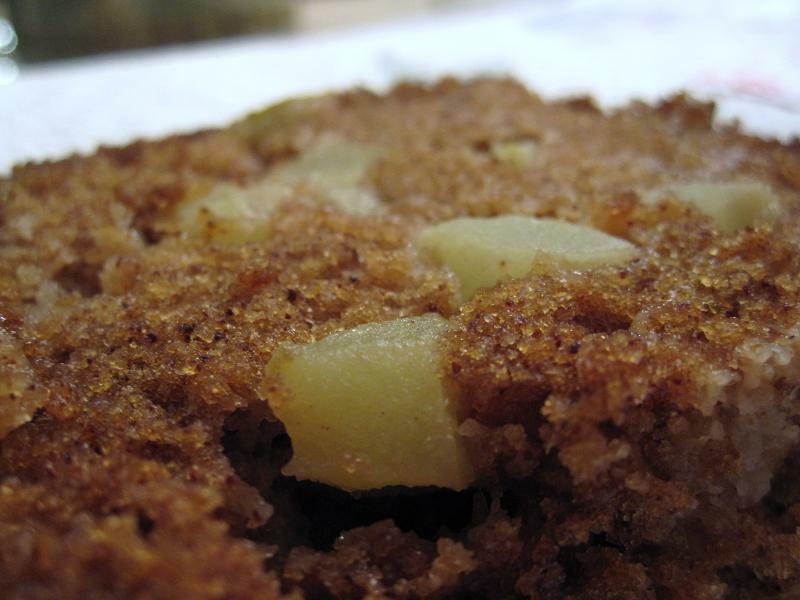 The bread is faintly sweet, dotted with the chunks of Granny Smith apples, and finished with a sugary topping. 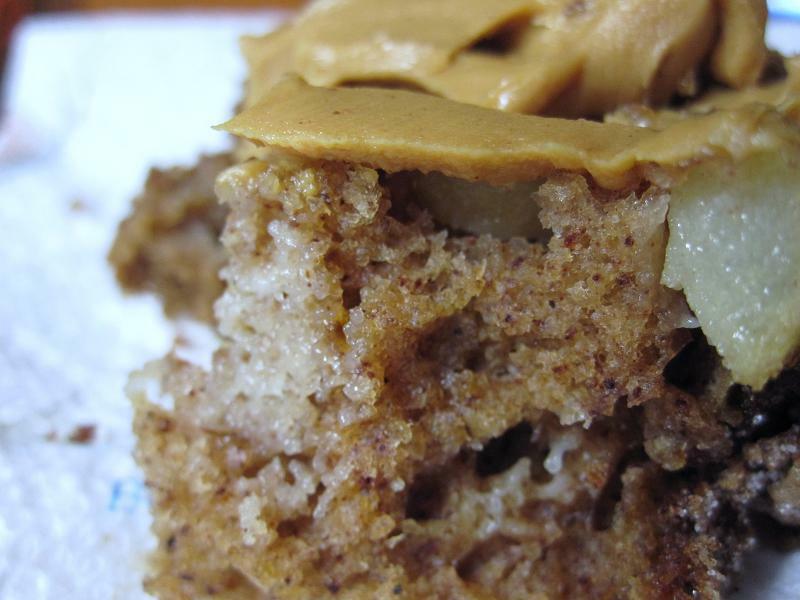 With a bit of peanut butter spread on top, it’s a little slice of heaven. The perfect snack. The perfect little thing to show him I was listening and I cared. Preheat oven to 350F. 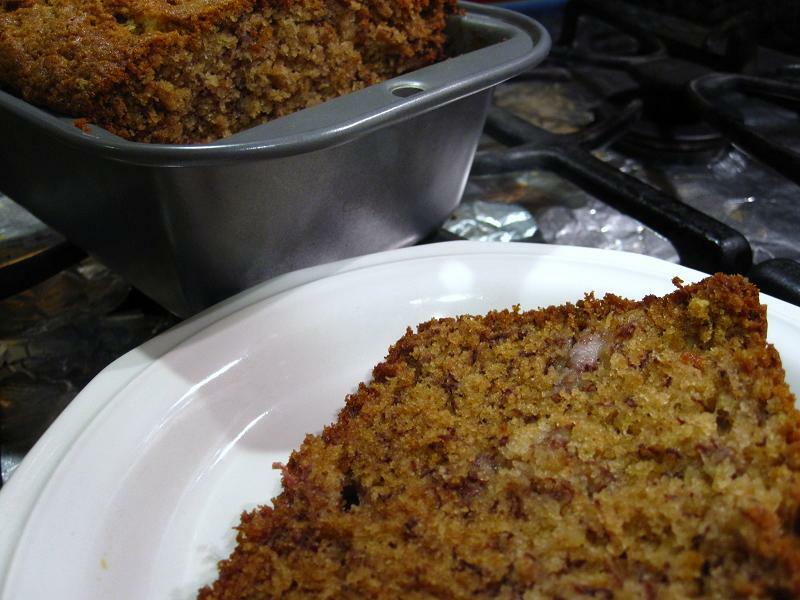 Grease a 4×8″ loaf pan and line with parchment. Set aside. For loaf, In a medium bowl, whisk flour, cinnamon, baking soda, salt, nutmeg, cloves, and ginger. Set aside. Using an electric mixer, beat eggs. Add in oil, applesauce, and vanilla and mix until smooth. 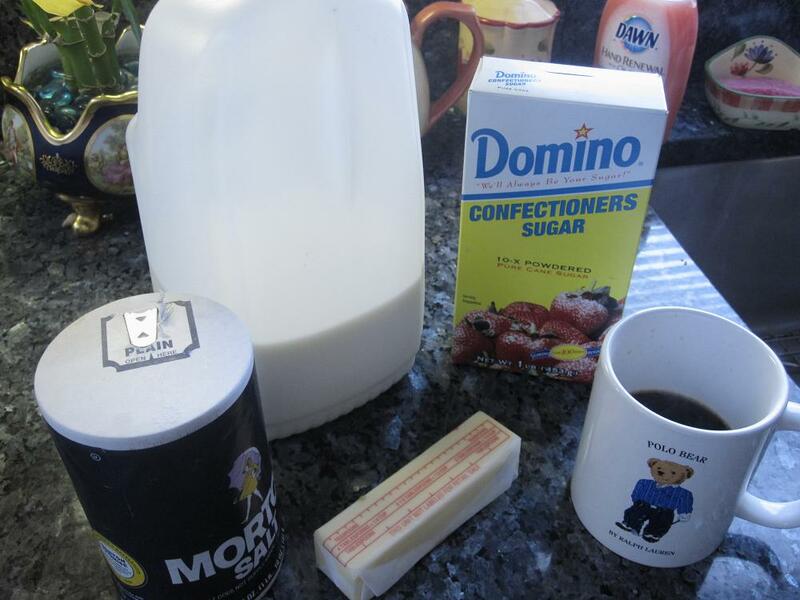 Add sugar and mix until combined. On low, add in the flour mixture and, careful not to overmix, mix until just combined. Fold in the apples with a rubber spatula. Pour batter into prepared pan. For topping, Mix sugars and cinnamon in a small bowl. Sprinkle evenly over batter in pan. Bake 50-55 minutes or until tester comes out clean. Allow to cool for 10 minutes in the pan before turning the loaf out onto a cooling rack. I wish I had the time or the energy to really sit down and reflect on this past year at this moment but the past few days have been filled with snowboarding aka falling down a lot and being sore a lot. The good news, however, is that I think I finally have it down so I can at least reasonably go down a mountain with less than a dozen falls and less than half of those as actual falls. (I often sit down as a way of stopping but since this is purposeful I don’t see it as falling per se.. Go with it.) So it’s actually been good but my entire body hurts more at this point in time than it has ever hurt before. Is it strange that I’m proud of having beat up my body sufficiently enough to inflict such pain on myself? In general though it’s been a great year. 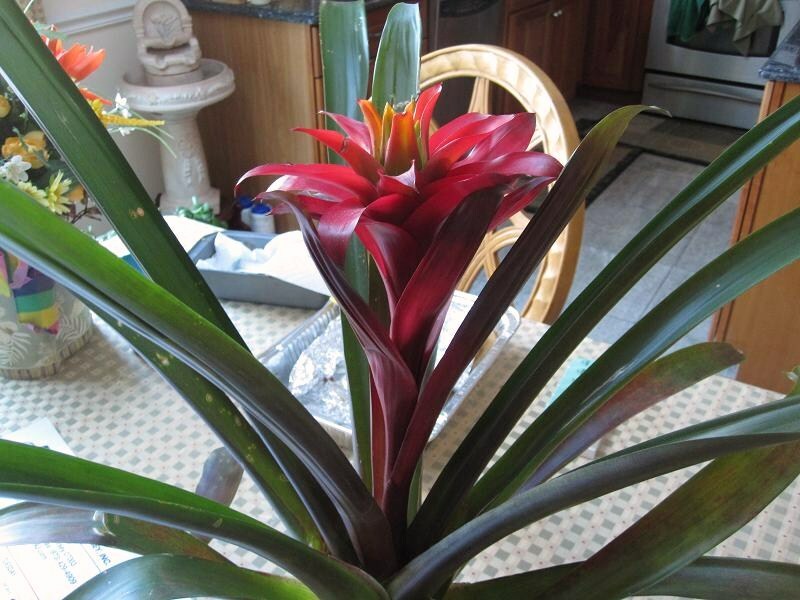 I started this blog and have met some wonderful people on it. I’ve pushed myself harder than ever before and I’m excited to see what the new year brings to Small Town Oven. My blog resolution for 2011: Create a new recipe each month to share on STO. Let’s hope I keep it! In other reflections, I started my final year of medical school, began interviewing for residency positions (meaning a job), went to several weddings of people I love and adore, took a trip to Vegas, vacationed in London and Ireland, got a Kindle, and had some great times with some great people. It was a good year but I’m ready for the new one to begin. But not without my banana bread!! 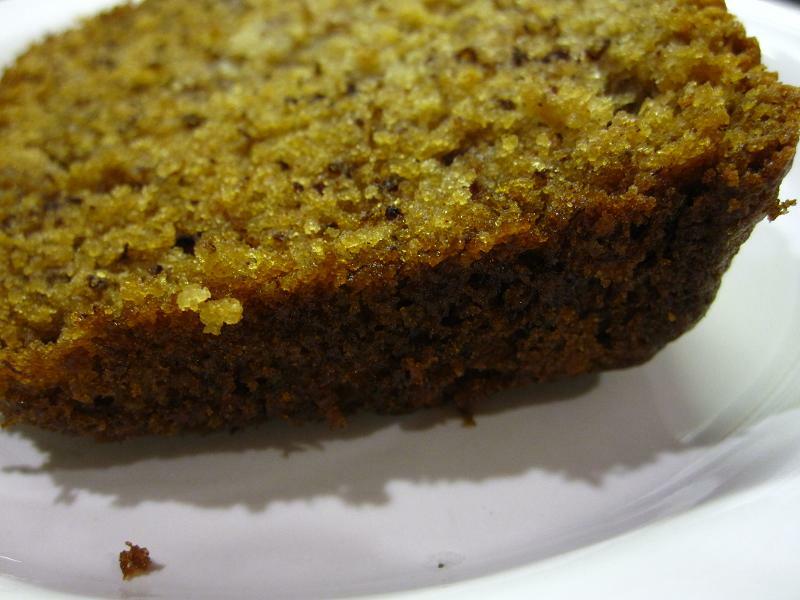 This banana bread is a completely fantastic way to use up those bananas you have sitting on your counter getting older and darker by the minute. It’s soft, banana-y, and creates a wonderful crust (for your 93-year-old grandmothers who enjoy the burnt parts). It’s great for breakfast, mid-day snacks, or midnight munchies. 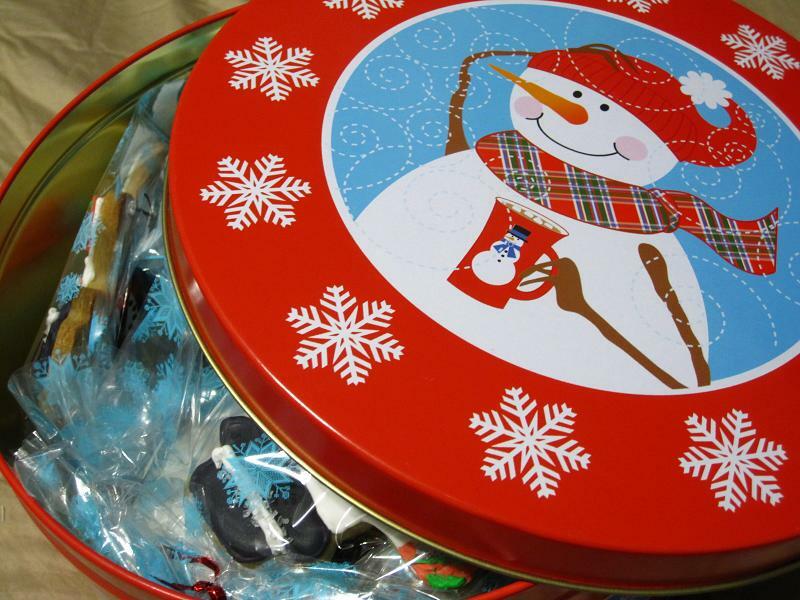 Bring it to friends’ houses, family gatherings, or eat it all yourself and don’t tell a soul. I won’t tell. You have a little under 12 hours before that New Year’s Resolution hits. Just enough time to bake, eat, and hide the evidence! Makes 1 9″ loaf (or an 8″ loaf with lots of crust). Preheat oven to 325F. Grease loaf pan however which way you like (I used butter). In a small bowl, mash the bananas with the milk and ground cinnamon. Set aside. 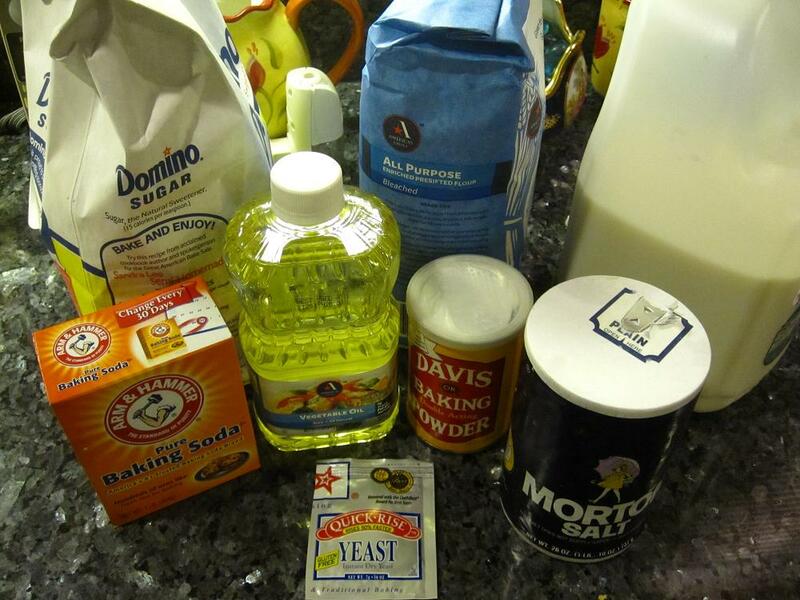 In another medium bowl, combine the flour, baking powder, baking soda, and salt. Set aside. Using a stand or hand mixer, cream butter and sugar together until well combined. Add in eggs one at a time, mixing until incorporated. Then add in the banana mixture and combine. Stir in the flour mixture until the flour just disappears. Pour into loaf pan and bake 1 hour to 1 hour and 10 minutes or until a toothpick comes out clean. Let cool in the pan for 15 minutes before turning out (or keep it in the pan which is what we do). How was everyone’s Christmas? I hope you shared some gifts and some love and some laughter! I’m sure many of you had cinnamon rolls these past few days, or maybe you haven’t caught on yet and are looking for a way in. 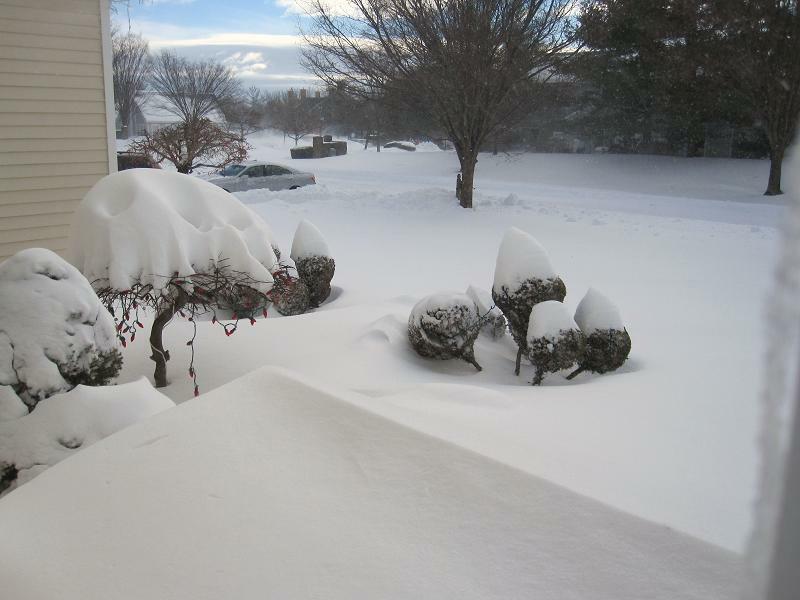 There’s somewhere over 2 feet of snow out there. It all started at 11am and let up overnight or maybe early this morning, I’m not quite sure. On Christmas Day my family went to our annual Christmas Part 2 party and late that night we all managed to get sick. So being snowed in the day after was quite welcome. It meant a day of recovery and rest but also a day of me and my brother on the couch watching tv, laptops in front of us, hanging out while my parents and grandmother hibernated in their rooms. There was little eating due to the previous night’s events but at some point in the afternoon I needed some sustenance. Don’t get me wrong, there was plenty of food to be had since we hold the Christmas Eve party (Christmas Part 1) and there were quite a few leftovers. But.. I wanted something warm, fresh from the oven, full of cinnamon, and covered in sweet glaze. I had to have cinnamon rolls. 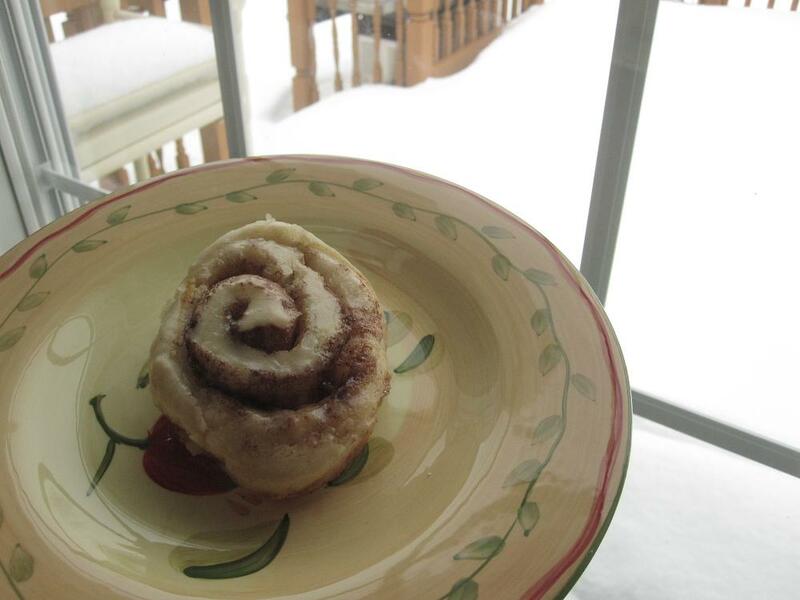 As I’ve shared before, I’m in love with the Pioneer Woman’s cinnamon rolls and apparently snow = cinnamon rolls in my mind because it snowed back then too. The only “problem” with that recipe is that it has to rest/rise for a long period of time, makes a TON of rolls, and involves a good amount of butter/oil. (Is too much butter really a problem? My heart says no. My thighs say yes. Help.) So I was in search of an easier and more figure-friendly recipe. 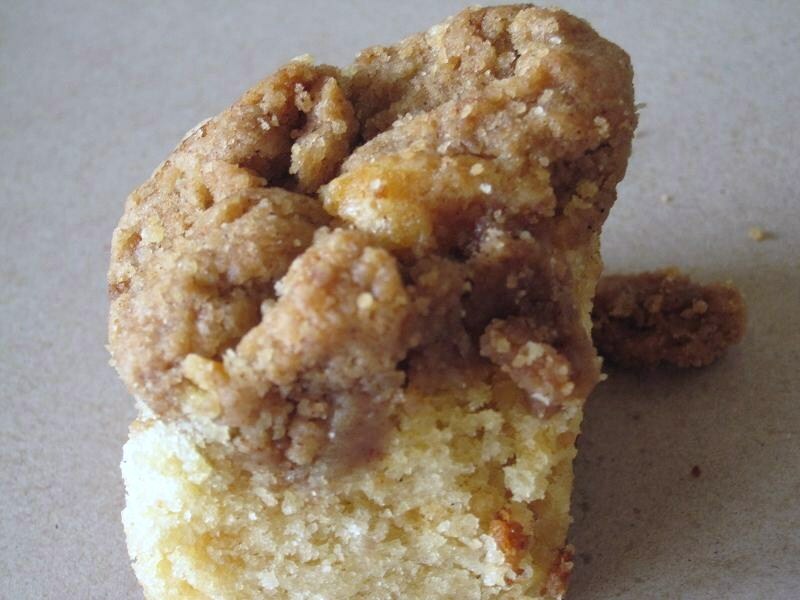 From Our Best Bites, this recipe can be baking in a little over an hour and only have a 1 3/4 sticks of butter in it! Plus it only makes 12, perfect for everyone to have their fair share without clogging too many arteries. (Trust me, I’m a doctor.) The rolls came out wonderfully soft and airy. 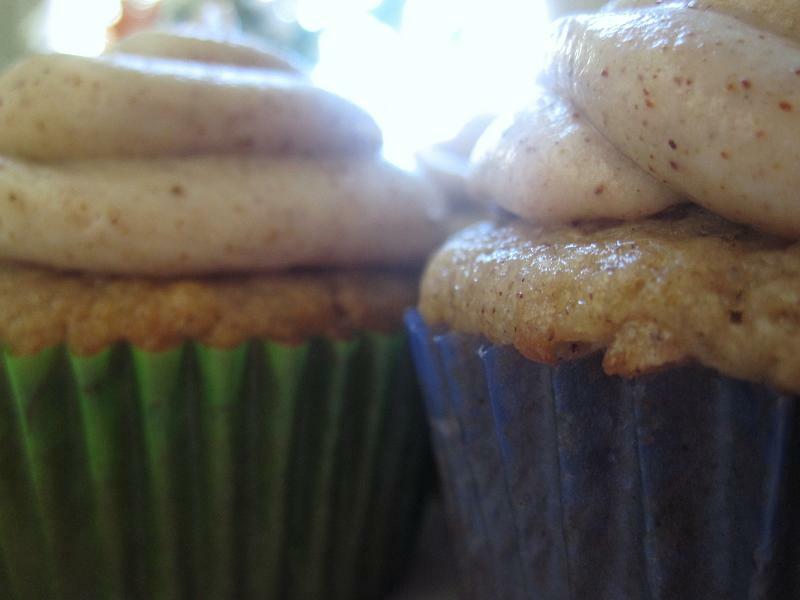 Just enough cinnamon to be present but not overpowering. A tiny bit of glaze as a perfect “cherry on top” but they’re not drowning (which, admittedly, I do sometimes want). 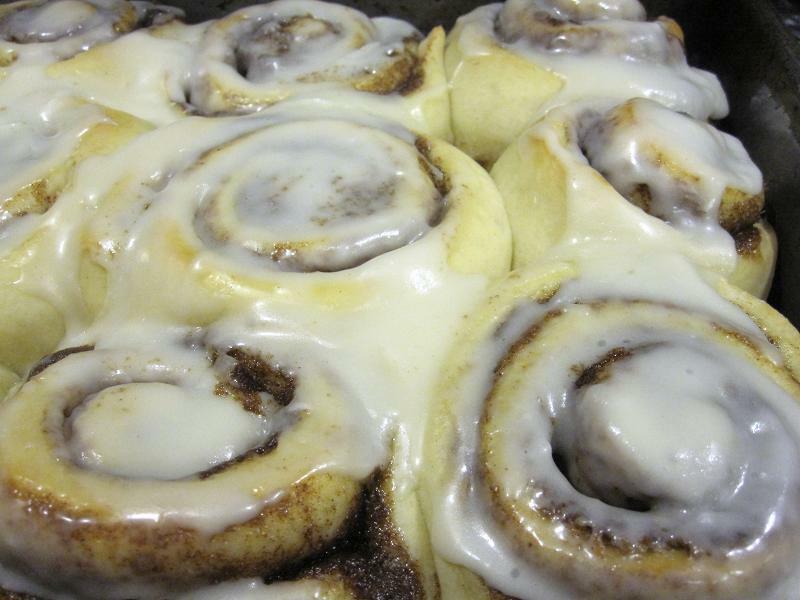 These are excellent “everyday” cinnamon rolls. 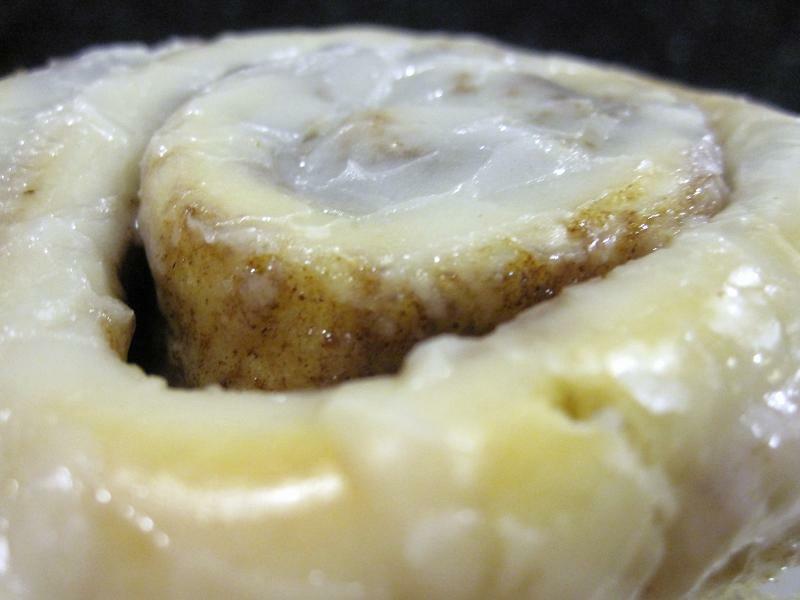 They’re not over-the-top but they fit the bill for any cinnamon roll craving. You know you want a bite! 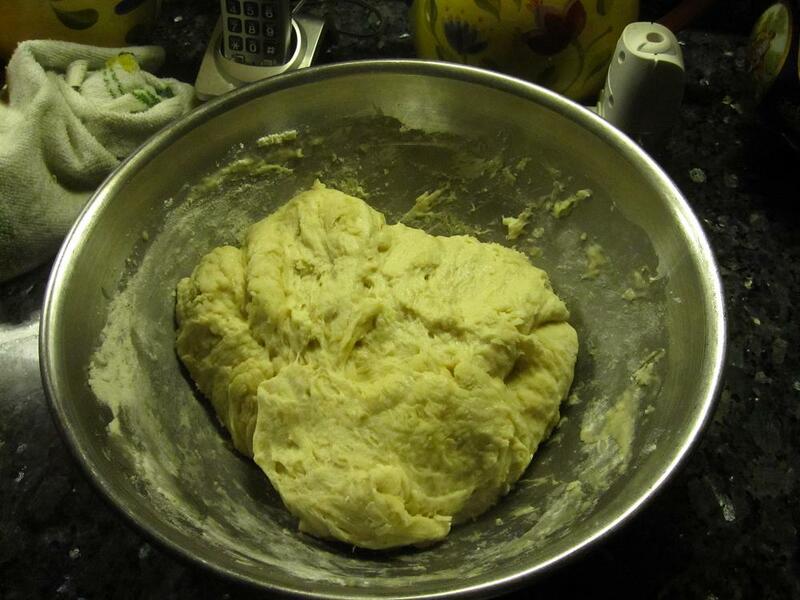 For dough: In a microwaveable bowl, heat 3/4 c milk and butter for 90 seconds. Stir, add remaining milk, and let cool until lukewarm. In the bowl of a stand mixer fitted with a paddle attachment or large bowl for a hand mixer, whisk together flour, salt, sugar, and yeast. 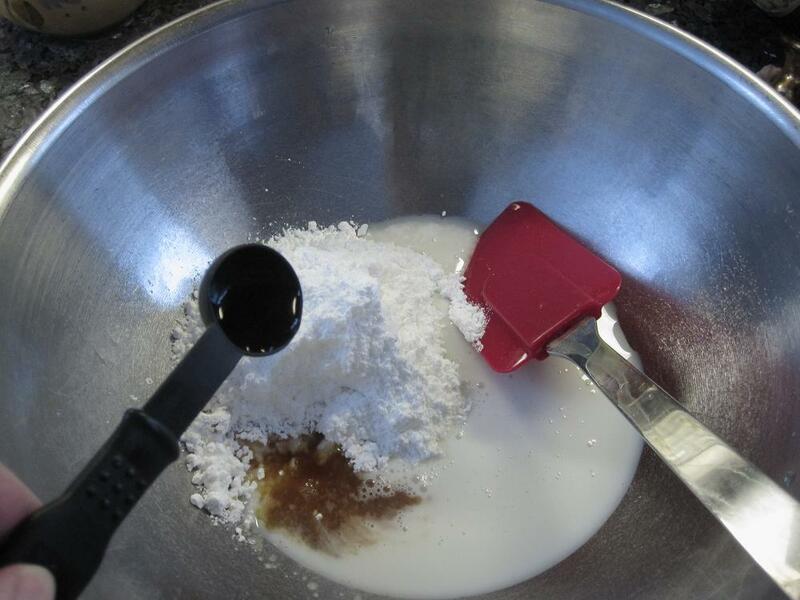 Once milk has cooled to lukewarm, begin pouring milk into flour mixture while mixing constantly. Add in the egg and beat until well combined. 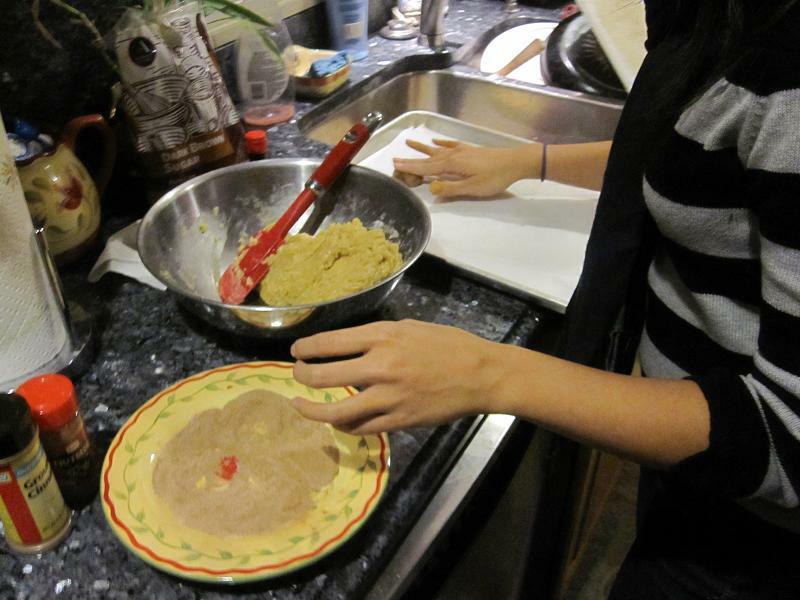 Slowly add in the remaining 1 1/4 – 1 1/2 c flour and mix until the dough just barely leaves the sides of the bowl. Switch to a dough hook or knead by hand on a well floured surface for 5 minutes. 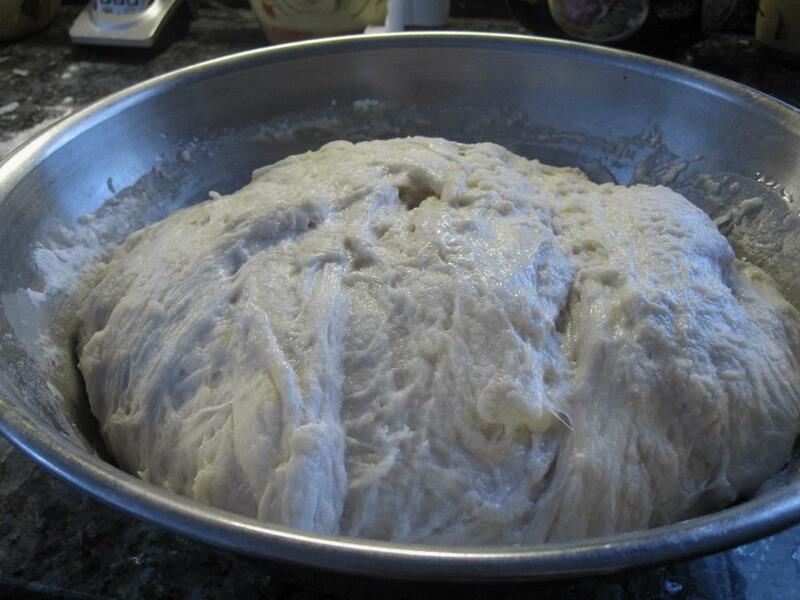 Allow dough to rest on a well-floured surface for 10 minutes. For filling: Mix butter, sugars, and cinnamon until well combined. For assembly: Butter or spray 9 x 13″ baking pan. 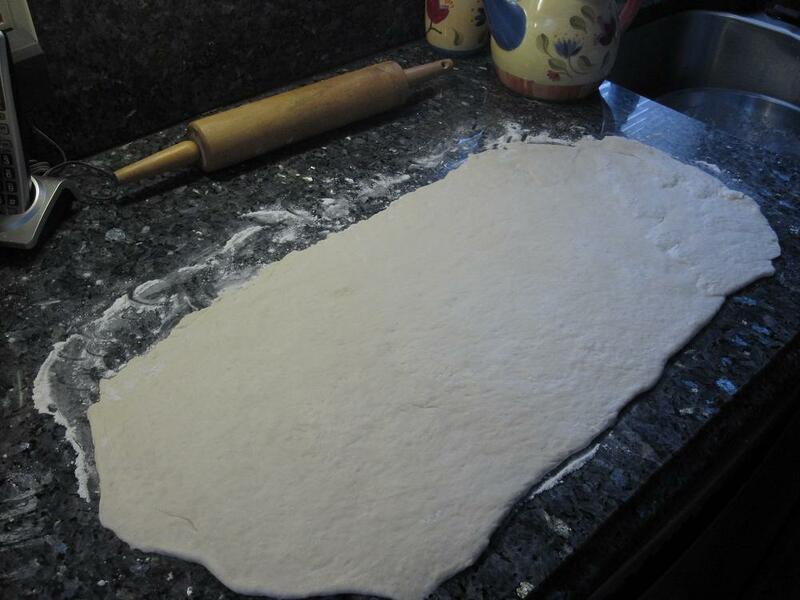 Roll out dough to 12 x 18″ rectangle. Spread filling over dough using the back of a spoon as needed. Roll the long sides and pinch the ends closed. Score and cut out 12 rolls, placing them in the prepared pan. Allow to rise for 30 minutes, covered with a clean towel. (I did this by heating my oven to 200F then turning it off, placing the rolls in, and leaving the oven door ajar.) Bake at 350F for 15-20 minutes or until lightly golden brown. 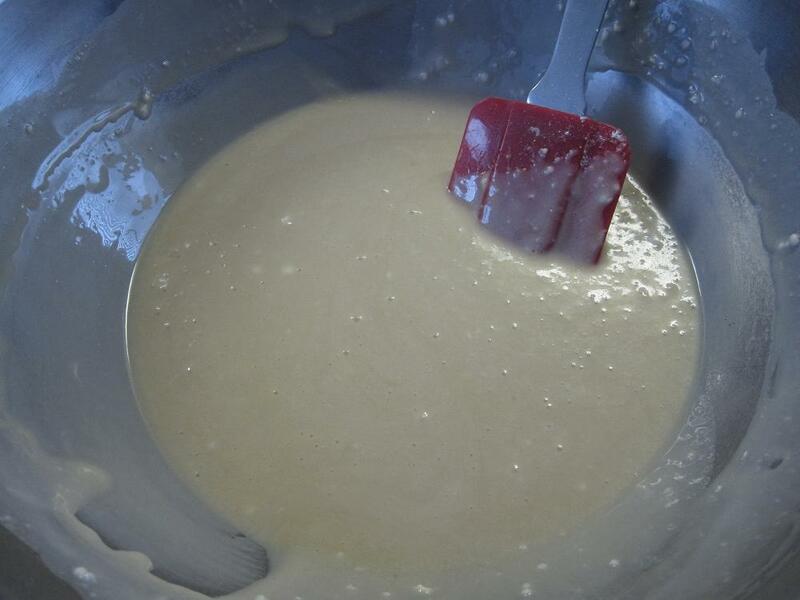 For glaze: Mix sugar, milk, vanilla, and butter together until smooth. Adjust with extra sugar or milk as needed. Pour over warm rolls. Friends, I got a Kindle for Christmas from Boy. (I know. He’s a keeper!) Do you read? If so, any recommendations? I love the holidays, don’t you? Although I’d like to think I’m a pretty giving person, this is the time I pull out all the stops. Like the holiday potluck I threw last night. I decided to throw it together a week ago at the last minute. I decided I’d make a pot roast for the first time. And I’d finally make little giveaway frosted sugar cookies for the first time. And I’d make homemade caramel for the first time. And I’d make three different types of mini-cupcakes so everyone could finally taste them instead of just me and Boy. But it somehow all came together despite the busy of everyday life and my next few posts will be dedicated to all the treats I managed to pull out of my kitchen this past week, starting with these sugar cookies! I’ve wanted to make these for a long time, especially since Annie is essentially my idol and she makes cute ones all the time. So I went out hunting for cute cookie cutters and came home with everything I needed to make little snowmen and snowflake cookie packages. The process takes quite a bit of time (took me a whole day) when you’re starting out. I presume that as I get better and better at piping things will go much more smoothly. If you’re starting out too and are aiming for perfection, I definitely suggest setting aside a good chunk of time to do everything. These spiced brown sugar cookies are perfect if you’re looking for something different and unexpected for the holiday season. 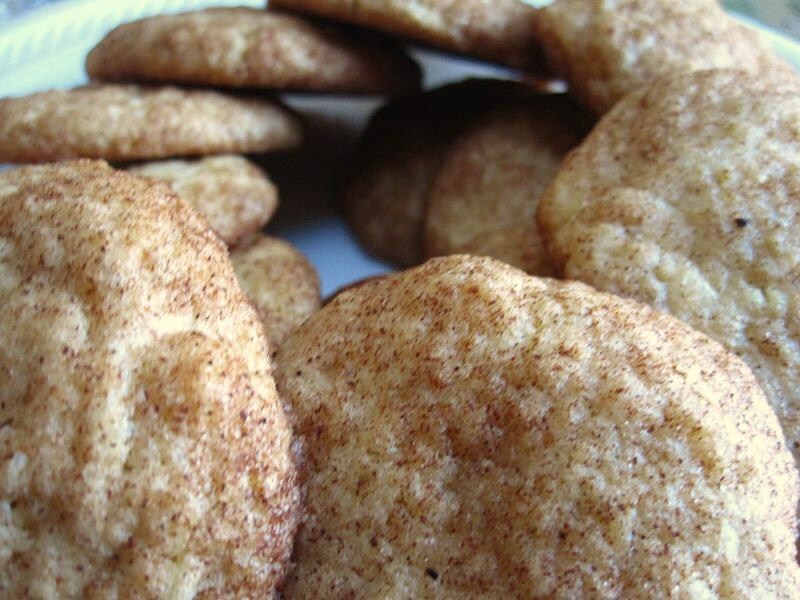 Adding the spices and the brown sugar to the mix definitely make these cookies feel warm and comfy. I also loved how this recipe didn’t require you to refrigerate the dough (though you could if you wanted to) so the whole baking process went by pretty quickly. Preheat oven to 350F. Line several baking sheets with parchment paper. Combine flour, salt, cinnamon, ginger, nutmeg, and cloves in a medium bowl. Set aside. 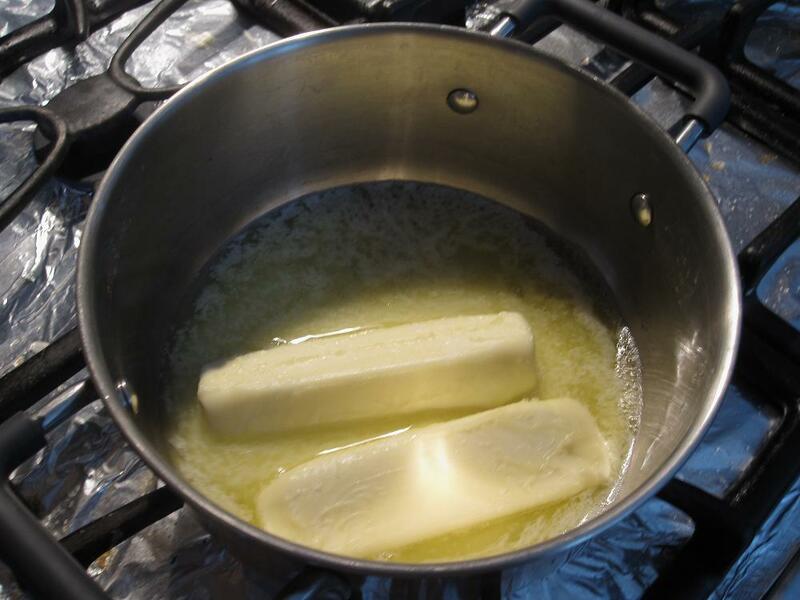 Using a stand or hand mixer cream together butter and both sugars on medium-high speed for 2-3 minutes. Add the egg and vanilla and mix until well combined. Mix in the flour mixture until just incorporated. Turn dough out onto work surface and knead slightly if it is too crumbly. Roll dough out to 1/4 inch thickness and cut out shapes as desired. Place shapes on baking sheets. Bake one sheet at a time for 9-12 minutes. 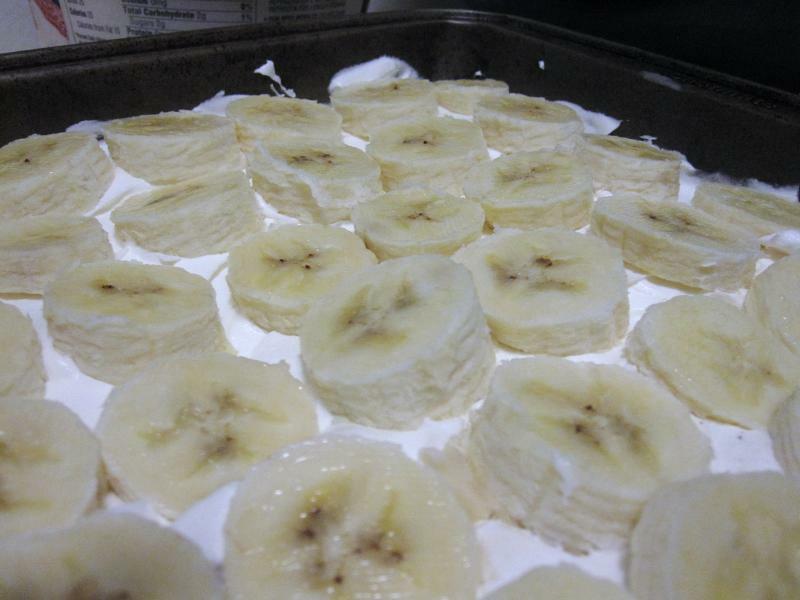 Allow to cool for several minutes on the sheet prior to moving them to a cooling rack. 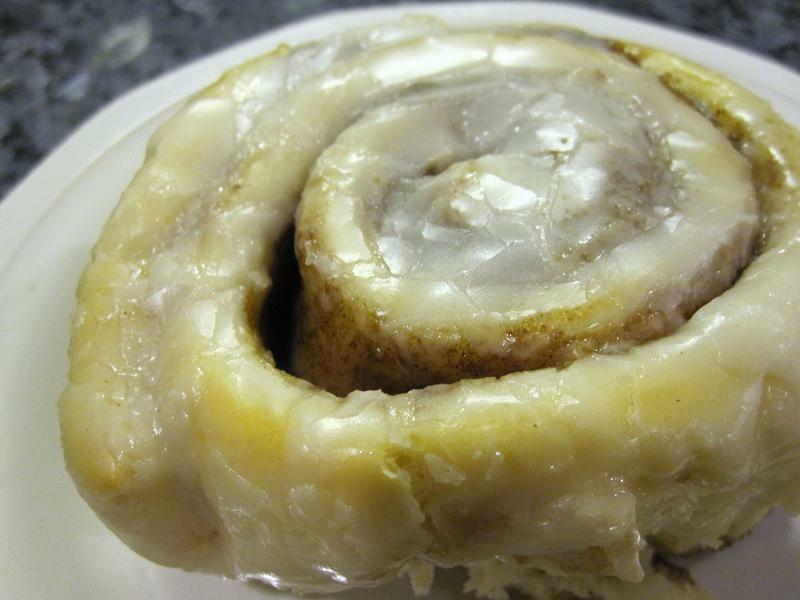 Note: Dough can be refrigerated as a ball/disk prior to rolling it out or as already cut-out shapes for at least several hours provided it is covered tightly in plastic wrap in either scenario. Combine ingredients in a large bowl fitted to a stand mixer with a paddle attachment. Mix on low speed for 7-10 minutes or until the sheen has disappeared and the icing is matte. Transfer to an airtight container. Add water, mixing thoroughly by hand, a little bit at a time until the consistency is appropriate for piping, meaning liquid enough to pipe but stiff enough that it won’t spread. Divide into various airtight containers depending on how many colors you want to use. Color icing using gel coloring (if using liquid, you will need to cut back on water or add powdered sugar). Transfer some of the icing into piping bags fitted with an appropriate tip (I use Wilton #2 and #3 tips) and cover the remaining icing. 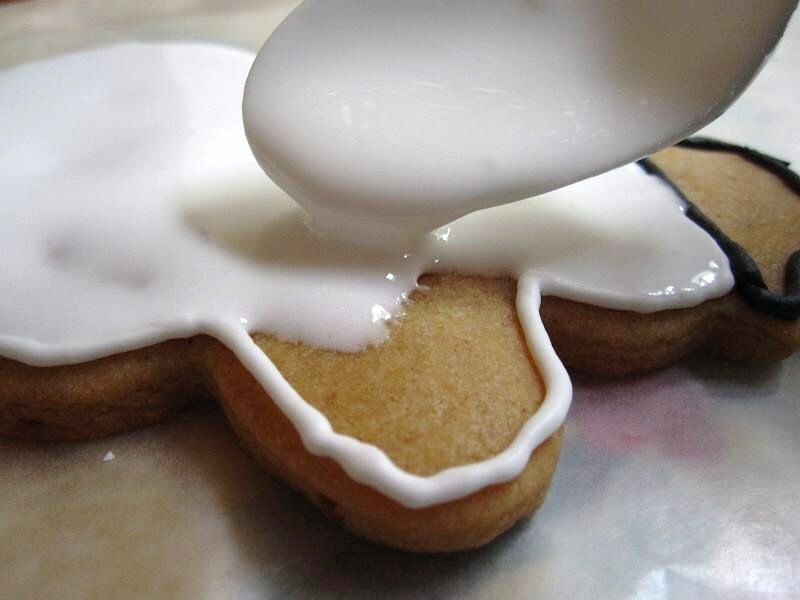 Pipe around the edges of each cookie and allow to dry for at least an hour. Then, water down the remaining icing a bit more until it is appropriate for flooding, meaning able to spread but not so thin that it will take forever to dry. Using squeeze bottles, fill the cookies. 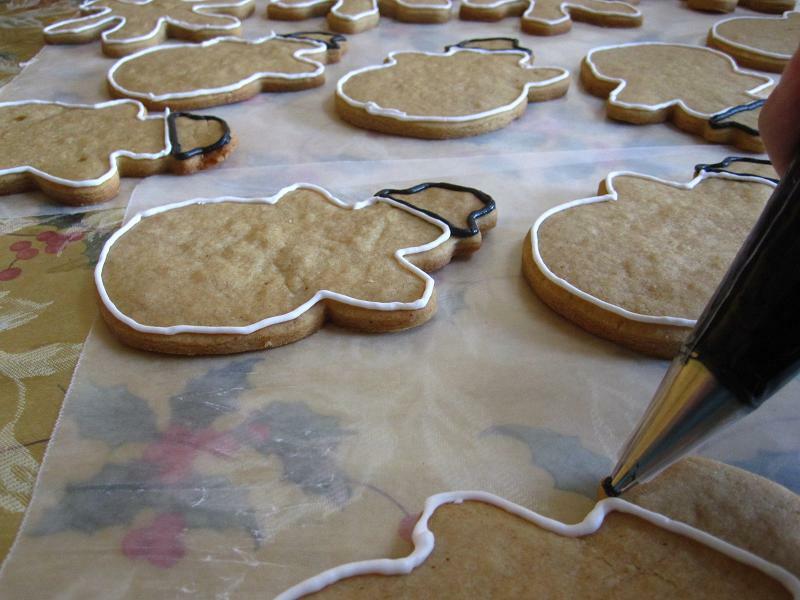 Allow to set and then decorate with the piping bags. 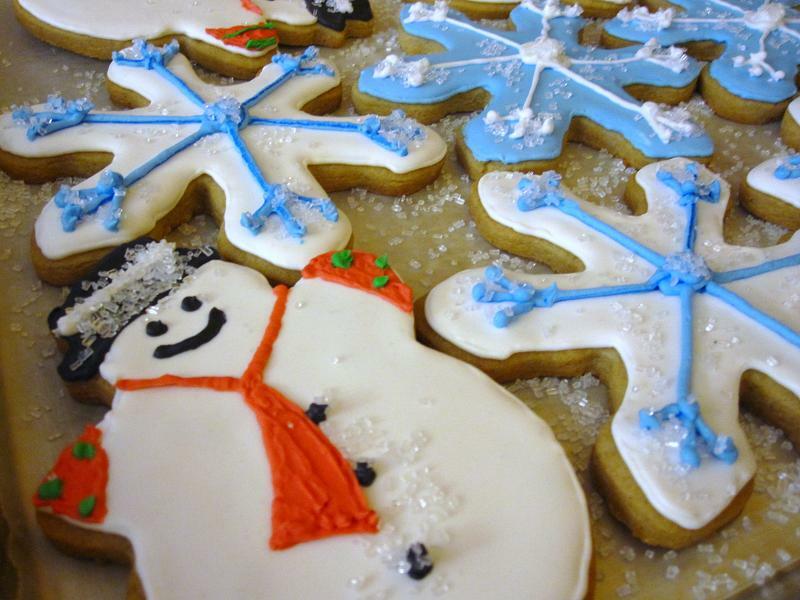 See the tutorial that I used on decorating cookies at Annie’s Eats here! 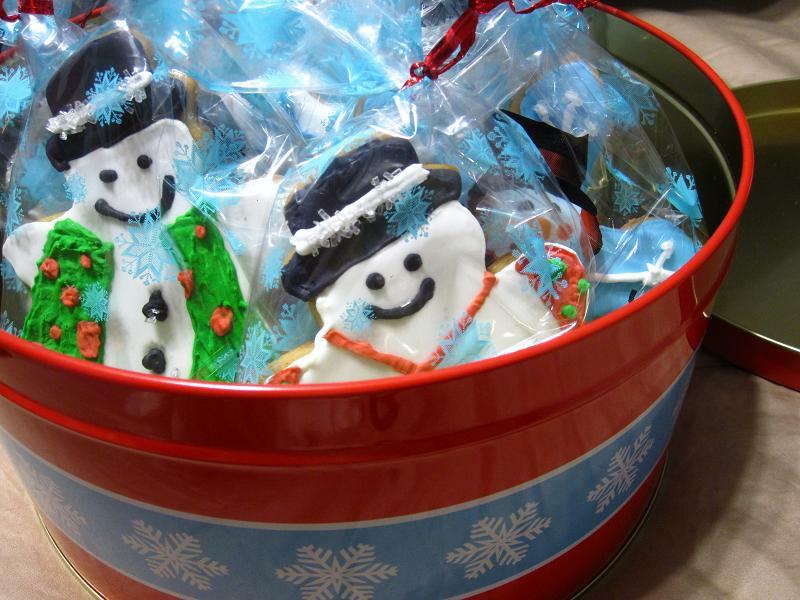 What are you bringing to the holiday parties you’re attending this season? I am currently sitting in a hotel room in between an interview I had today and the dinner for my interview I have tomorrow. I cannot wait to be done with interview season. Especially so I can bake this cake again because it is the one and only thing my dad has outright told me I must make again. It’s that good. One of my interviewers today saw that my personal statement had mentioned my love for baking (since I couldn’t think of anything else to write about besides cupcakes). She asked what my favorite thing to bake was and then what was my favorite bakery. I could have very easily said Baked in Brooklyn since I’ve now tried making their brownies and this cake. But perhaps that wouldn’t be truly honest since I’ve never actually made the trek over to spend actual money there. (Have you? Did you like it?) So, instead, I picked Two Little Red Hens. Their cupcakes are the perfect size and are absolutely delicious. I haven’t sampled their other items quite yet but I’m happy munching on their red velvet! 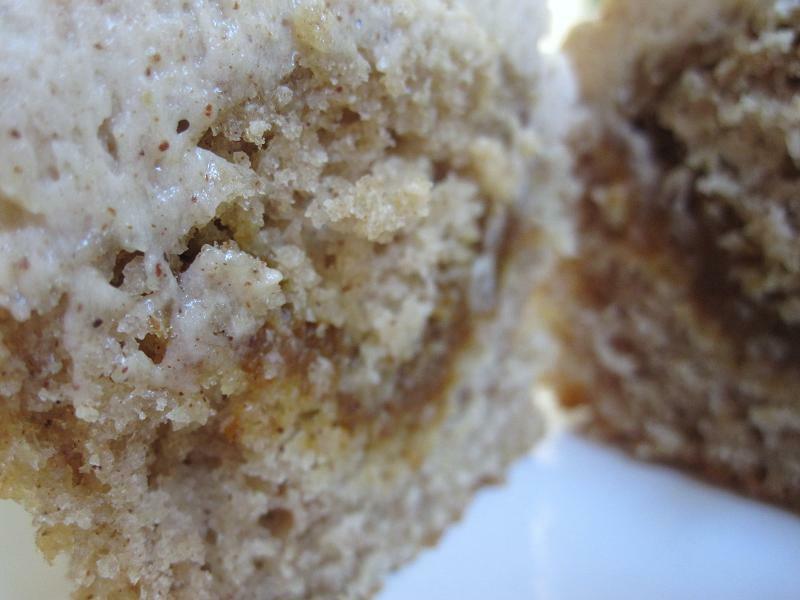 For Crumb Topping: Whisk together sugars, salt, and cinnamon in a medium bowl. Whisk in the melted butter until combined. Then fold in the flour until absorbed and set aside to dry. 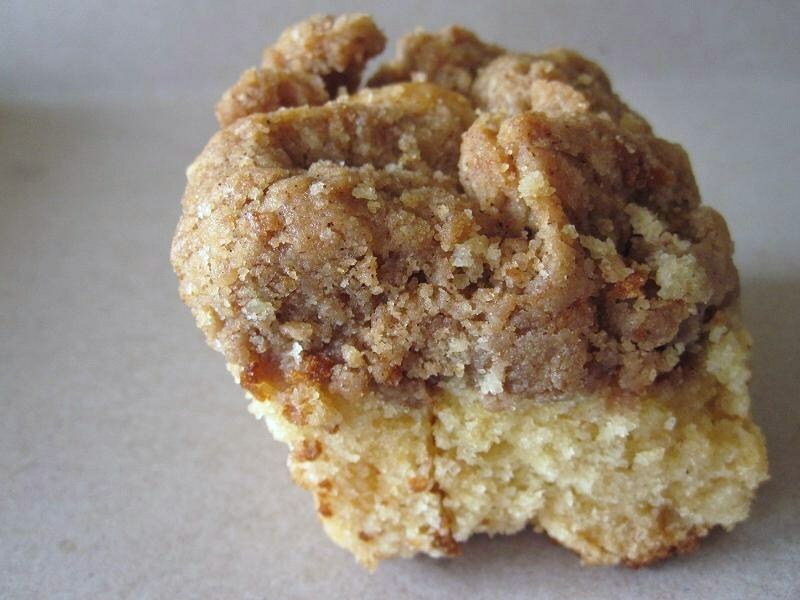 Drying creates the big crumb chunks. 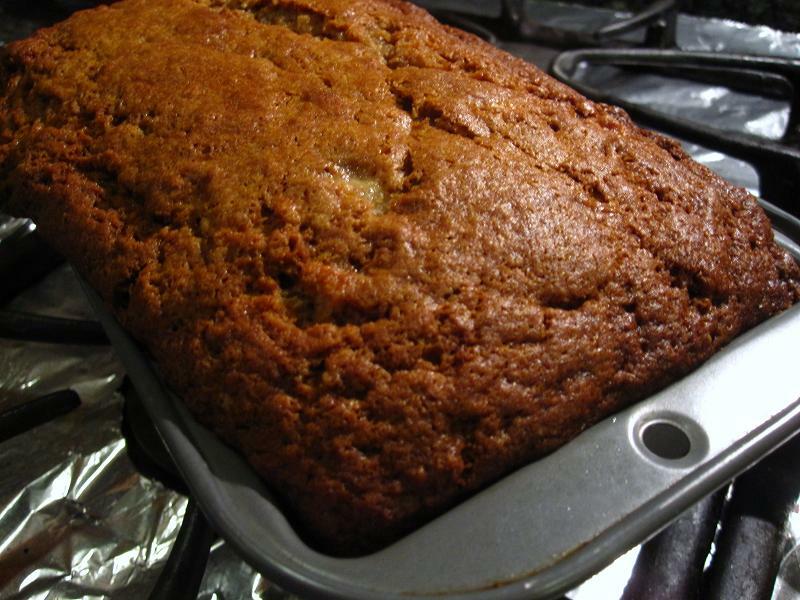 For Cake: Grease a 9×13″ pan and set aside. Sift together the flour, baking powder, baking soda, and salt in a medium bowl. Set aside. With a hand or stand mixer with paddle attachment, cream the butter until smooth and ribbonlike, scraping down the bowl as needed. Add sugar and beat until fluffy. Add in eggs, one at a time, beating until incorporated. Scrape down the sides of the bowl and beat for another 30 seconds. Add sour cream and vanilla and beat until just combined. Add dry ingredients in 3 parts and beat until just incorporated. Pour batter into prepared pan. Then take a handful of the crumb mixture and make a fist. The topping should hold together. Break off chunks of this and sprinkle all over cake. Continue until all the crumb is distributed. It will look like a lot but trust me (and the friend over at Baked). Bake for 45-55 minutes, rotating twice, or until a toothpick comes out clean. Cool on a wire rack for 30 minutes prior to serving. Short post today because this recipe is a doozie! Entry #3 Catherine! Congratulations! I’ll be emailing you shortly with the details. Thank you to everyone who participated. Hopefully this will be the first of many giveaways! 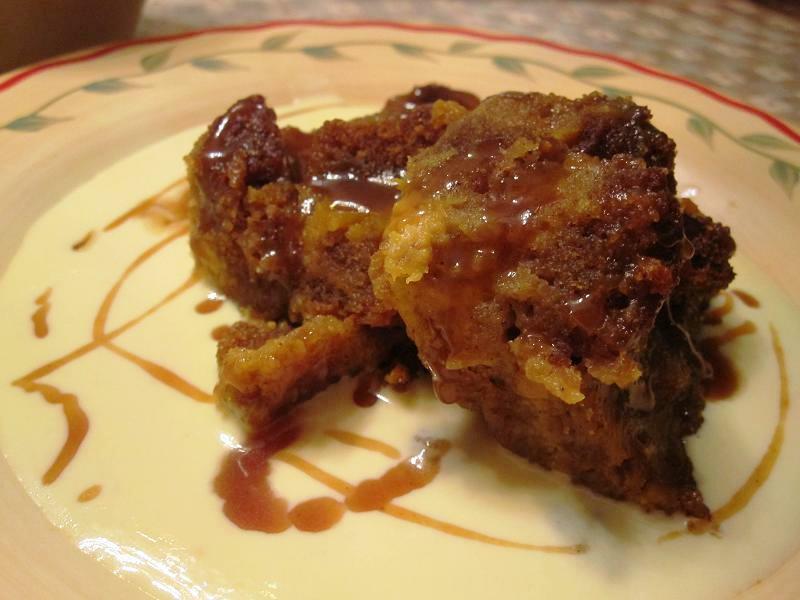 Secondly, since I kicked off this giveaway with a recipe for Chocolate Pumpkin Bread adapted from Bobby Flay, I’m sharing with you our Thanksgiving dessert: Bobby Flay’s Pumpkin Bread Pudding. You may be sick of the pumpkin goods by now but I’m certainly not. My trusty bottle of cinnamon doesn’t leave my side from November to January! Word of warning: This recipe has a lot of components and you end up with a lot of egg whites leftover (11 total). That being said, it’s totally worth it. Totally. I stretched it out over a few days and it was quite manageable: pumpkin bread on day 1, creme and caramel on day 2, and assembly on day 3. You could probably get away with buying pumpkin bread or using your own favorite recipe if you want to change it up. 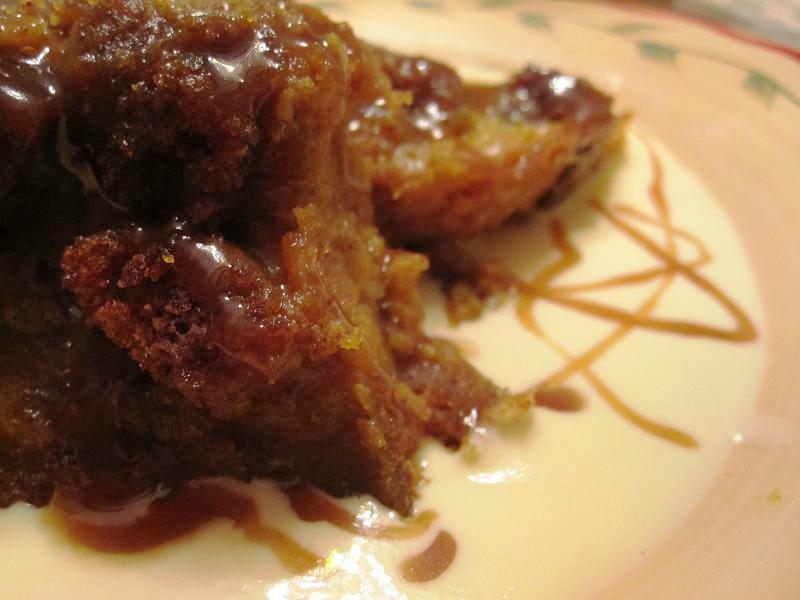 The bread pudding is also great on its own and you may opt to not make them but they both add something to the dish. The caramel cuts the thick creme and the creme balances out the sweet caramel. Both turn this dish into a real stunner. My five-person family ate the entire dish in one day. If you’re looking for a showstopper for your next holiday party, this is it. For Pumpkin Bread: Preheat oven to 350F. Lightly grease a 9″ loaf pan. In a small bowl, whisk together flour, salt, baking soda, baking powder, cinnamon, ginger, nutmeg, and cloves. Set aside. 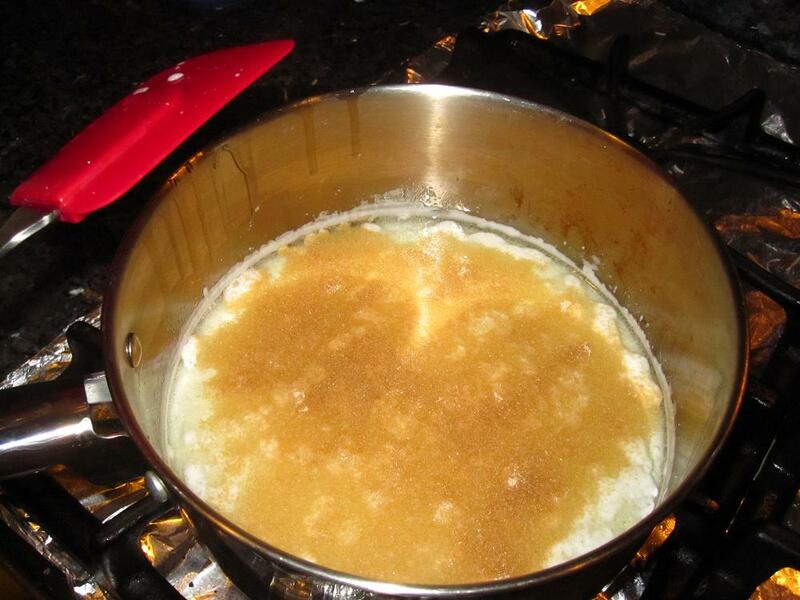 For Creme Anglaise: Bring half-and-half (and vanilla bean/seeds if using) to a simmer in a medium saucepan. Set a bowl with a strainer over an ice water bath. While the half-and-half is heating, whisk together egg yolks and sugar until pale and ribbon-like when whisk is lifted. When the liquid is simmering, temper the eggs by pouring in about 1/4 c of the liquid, whisking constantly. Then slowly pour in the rest of the liquid while continuing to whisk. Pour the mixture back into the pot and cook over medium heat, stirring constantly with a wooden spoon, until the mixture coats the back of the spoon with a thick layer that does not run when a line is drawn through it. Strain the mixture into the bowl atop the ice bath and stir until chilled. Cover and refrigerate until service. For Caramel Apple Sauce: In a small saucepan, combine cream, apple juice, ginger, cinnamon sticks, cloves, and nutmeg. Bring to a simmer, then remove from heat and let steep for at least 20 minutes. 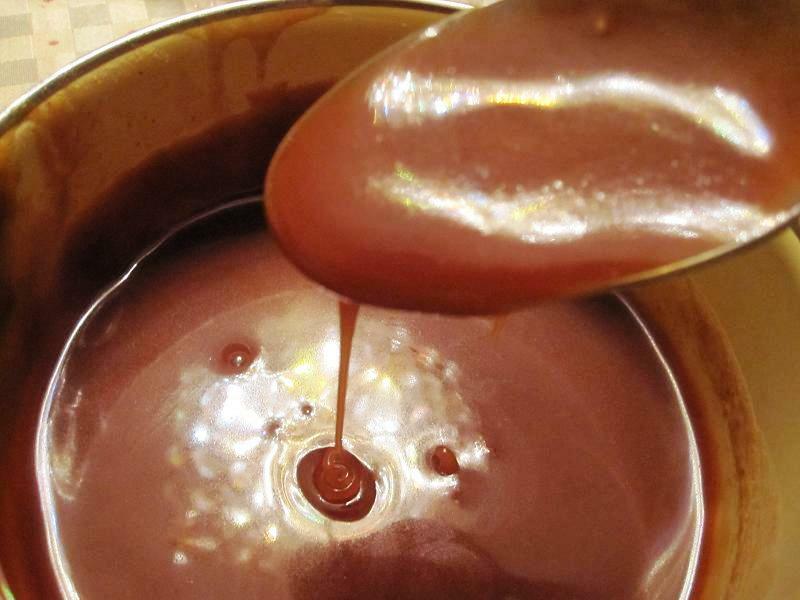 Strain into a clean saucepan and keep over low heat while making the caramel. In a separate medium saucepan, combine sugar, water, and vinegar. Keep over high heat and allow to cook without stirring until it is a deep amber. This will take about 8 minutes but watch it very closely as it is prone to burning in a short period of time. Slowly whisk in the warmed cream a little at a time until smooth. Be careful as the mixture will bubble up. Continue whisking and remove from heat if necessary. Add liquor and cook for about 30 more seconds. Serve warm. For Assembly: Preheat oven to 325F. 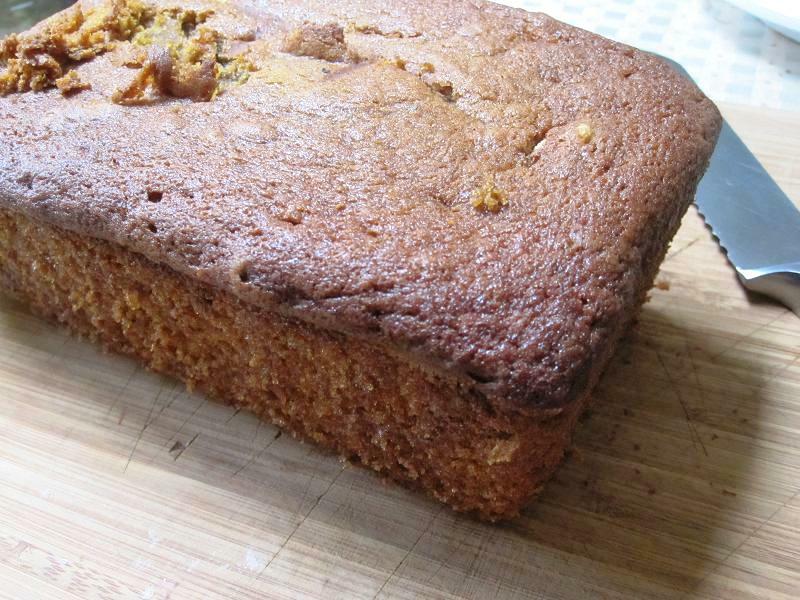 Cut pumpkin bread into 1/2″ cubes and place on a lined baking sheet. Toast in oven, turning once, for 20 minutes. Let cool. While toasting, make the custard by combining the cream, milk, and vanilla bean if using in a small saucepan over medium heat. Bring to simmer. Meanwhile, whisk together egg yolks, sugar, maple syrup, and pumpkin in a large bowl. 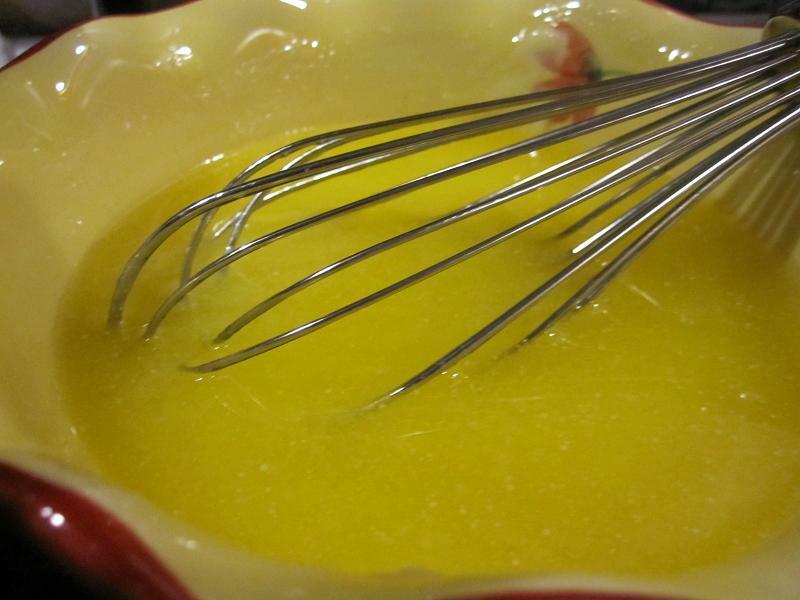 Once cream mixture is simmering, add about 1/4 c to the egg yolk mixture, whisking constantly. Then, still whisking, add the rest of the cream. Whisk in vanilla extract and liquor. Strain into a clean bowl. 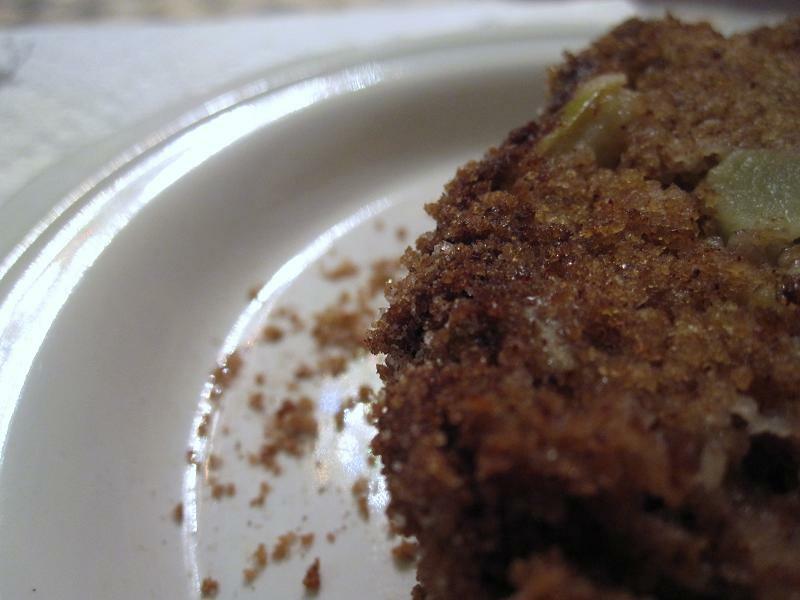 Scatter toasted pumpkin bread cubes into a 9×13″ baking dish. Pour custard over the bread, pressing them in so as to soak completely. Let soak for 15 minutes. I just realized I did not do this but B.Flay then says to place the baking dish in a larger roaster pan and pour hot water into the larger pan until it is halfway up the sides of the baking dish. If you’re lazy, our bread pudding was delicious without the water bath. Bake for about 1 hour at 325F or until just slightly jiggly in the center. 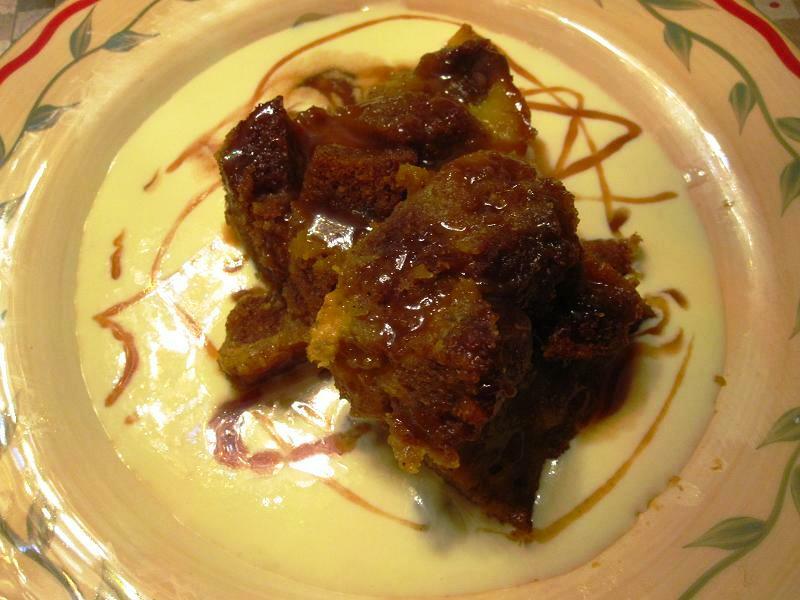 To serve, spoon creme anglaise into a shallow bowl and place portion of bread pudding on top. Drizzle caramel over pudding. Serve with whipped cream if desired though the dessert is quite rich already (but hey, I’m not judging). Are you sick of pumpkin yet? Brother Bear left late Saturday night to go back to law school. Anyway, my little brother went back to school earlier than we all would have liked. And, yes, I know he’s 22 now, can vote, can imbibe legally, and can be drafted, but he will always always be my little brother. He’s all I got in terms of siblings and we’re only 2 1/2 years apart so we’re pretty close. He’s a strong-willed little fella’ but, for me, he’ll drop mostly everything if I ask. I’ve heard his friends comment more than once that they could never imagine him as a “little” anything but the second I’m around they understand. This is not to make him sound like a sad little puppy around me. We just have a better relationship than most siblings. My parents thought he was developmentally delayed for a while because he didn’t speak until he was two. Why, you ask? Big sister (that’s me, by the way) doted on little brother soooo much he never had to speak! You get it. We’re Brother and Sister Bear of Berenstein Bears fame. But we don’t get to see one another much anymore since he’s away becoming a lawyer of sorts and I’m still chasing that doctor dream. So when we were both home for the holiday of Thanks there was a lot of laughter and silliness. But when he announced that he had to leave Saturday night to go study (my parents’ house is a black hole of unproductivity largely due to the big screen television) there was certainly some disappointment. Because he’s my little brother and always will be even if he lives miles and miles away now. These cookies are fantastic if you’re in a rush. You don’t have to bring the butter to room temperature since it’s just melted and they bake up in just 7 minutes. No stand or hand mixer to wash either! 2 bowls, 1 plate, a whisk, and a spatula (along with your measuring tools) are all you need. The most time-consuming part is the rolling etc but once you get into a rhythm it really doesn’t take long at all and is quite enjoyable. The result? A beautifully soft, fluffy cookie that’s rich (the two sticks of butter may have something to do with that) but not so rich that you don’t want to eat five more right away . 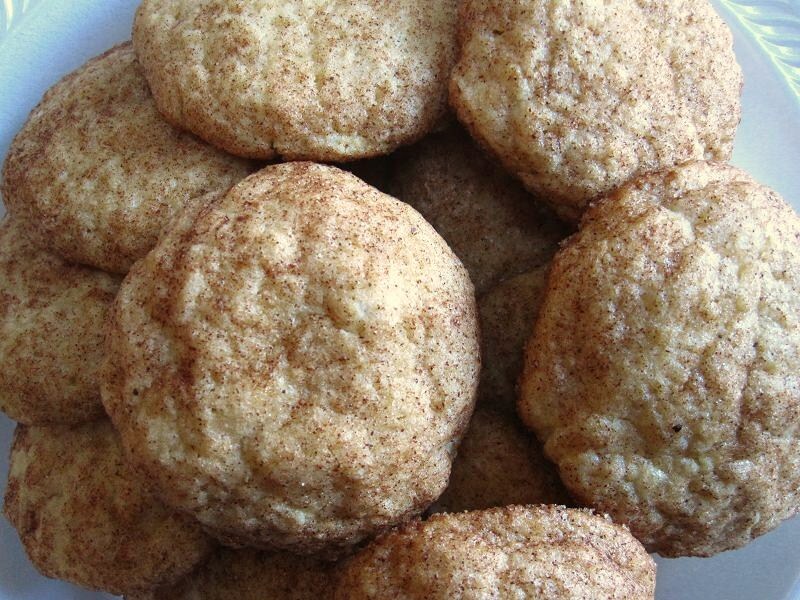 I call these “un-classic” because they don’t contain cream of tartar which is largely thought to be essential to provide a snickerdoodle with that little “bite.” These don’t have a bite. Do I miss it? Not really. But in case you would, know that these are biteless but completely delicious in their own right. Save this recipe for a rainy day. You likely always have all the ingredients on hand and they take no time at all! Makes 3-4 dozen cookies depending on size. Preheat oven to 425F. Take out baking pans but leave unlined (or line with parchment paper for easier cleanup). For Cookies: Melt butter in microwave and set aside to cool while making the rest of the cookie batter. Stir together dark brown sugar, granulated sugar, flour, cinnamon, nutmeg, baking soda, and salt. Then whisk eggs into melted and slightly cooled butter. Add vanilla. Stir wet ingredients into dry ingredients until just combined. 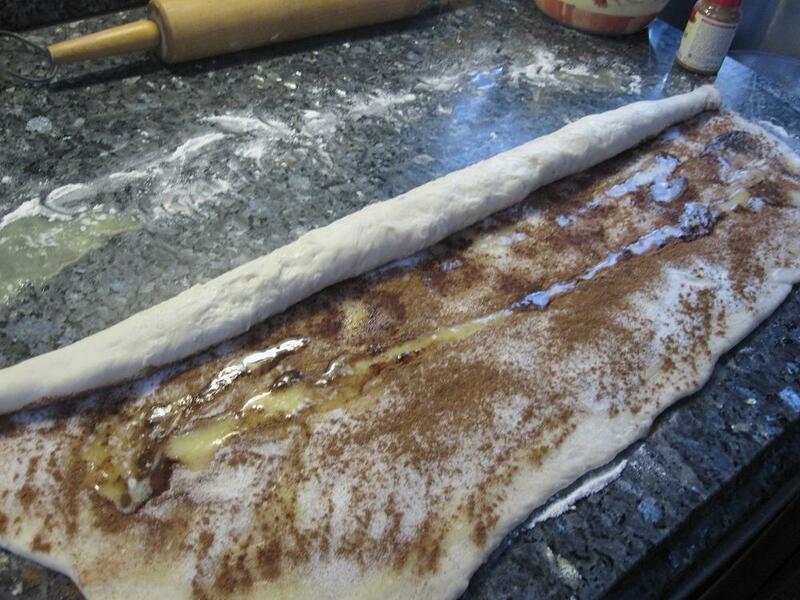 For Rolling: In a shallow plate, combine the sugar, cinnamon, and nutmeg. 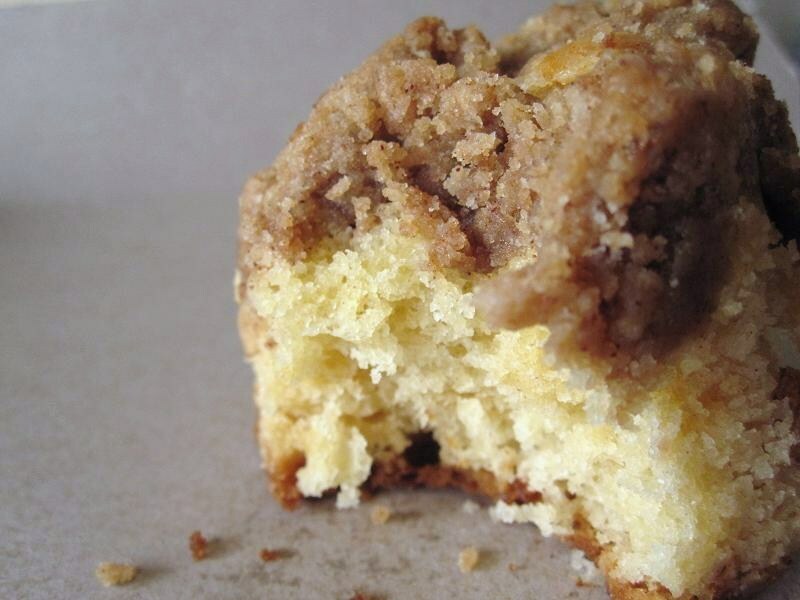 Form 1 1/2″ balls of cookie dough, then roll in cinnamon sugar mixture. 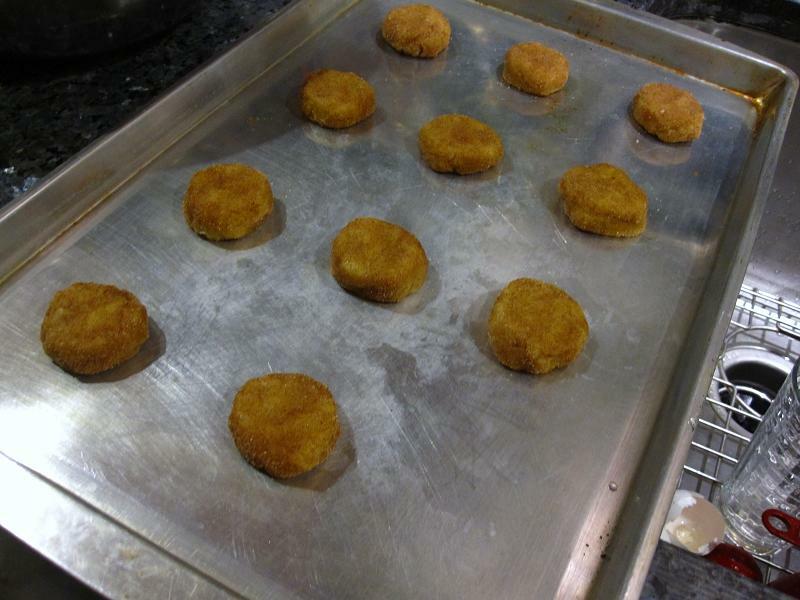 Place each ball onto baking sheet and flatten slightly. Space cookies about 1 1/2″ apart. Bake for 7 minutes and then cool on the pan. Don’t forget! Today’s your last day to enter for STO’s first giveaway! Contest ends at midnight TONIGHT. 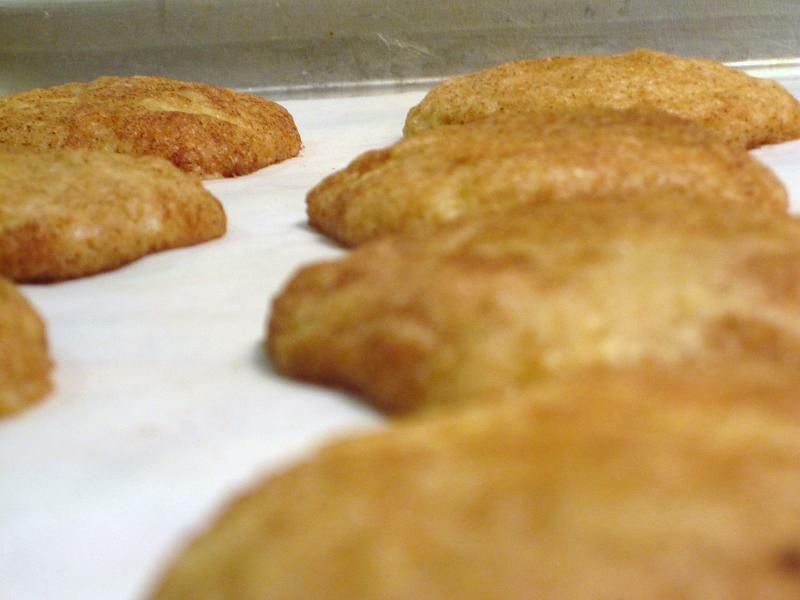 What’s your go-to cookie in a jiffy? What a difficult question! It seem so simple. There’s so much to say! I’ve lived for so many years, had so many experiences, but where does one start? Do you want to know about why I wanted to become a doctor? How about the time I puked in the hallway in second grade while everyone was walking for some event and I just kept moving as if it never happened? Do you want to know about my parents? Brother? Grandmother? Pet fish who died a few months ago? Which self do you want to hear about, is the questions I should reply back. It’s officially interview season for residency programs all over the country! My first one is tomorrow followed by my second on Wednesday right before my third on Thursday and my fourth on Friday. Yes, that’s right. Four full-day interviews complete with tours of hospitals in four days with an added “Meet the Residents” dinner the night before each and every one of those interviews. And this is only the beginning?! I have 13, possibly 14, scheduled interviews with the last on January 5 (for now anyway). How I’ll keep sane with all the travel is beyond me at the moment. I’m stuck in the present. The present, where I still have these cupcakes to calm me down the second I start hyperventilating about how these interviews will decide the next four years of my life, what city I’ll be in, which hospital I’ll work at. 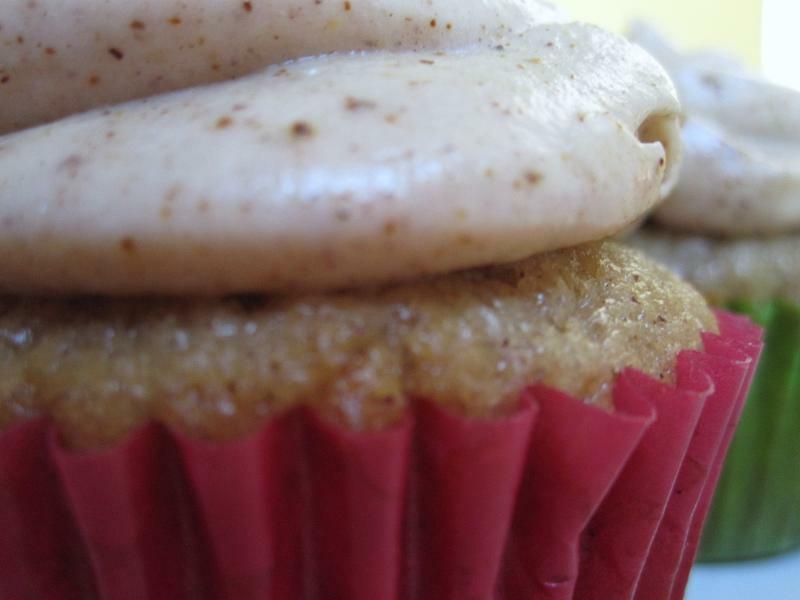 I’ve been thinking lately that it’s been awhile since I’ve come up with a new cupcake recipe. After much thinking and consideration, this idea came to me in an instant. Funny how things work that way, isn’t it? You spend all this time trying to plan it all out and, in the end, things just fall into place. These came together perfectly on the first try and they are a taste of hearty fall. 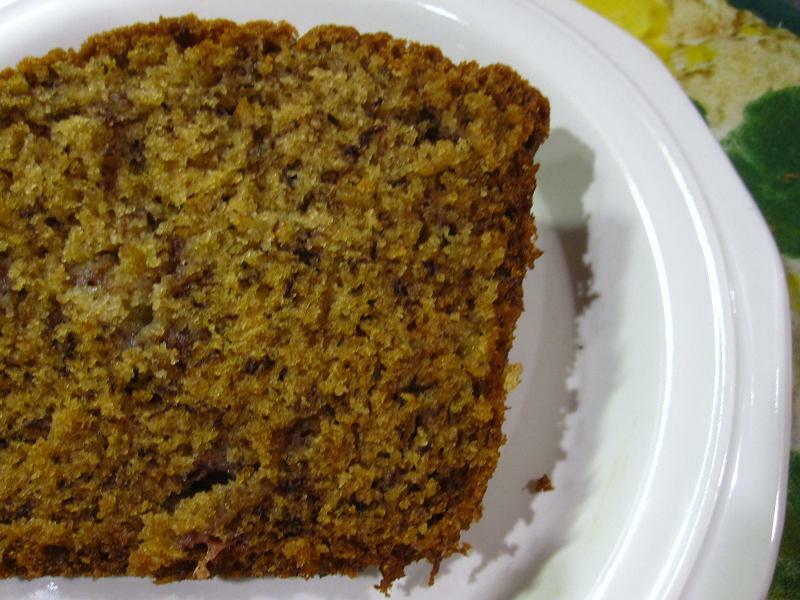 The cake itself is a bit dense, almost like a quickbread even. The filling and frosting are not overly sweet but are filled with spicy warmth. The combination is winning and every bit make me feel like I am home and settled into the autumn season. I urge you to make these as is or leave out the filling and frosting altogether and you have a semblance of a cinnamon muffin on your hands! Preheat oven to 350F and prepare a cupcake/muffin pan with lining papers. 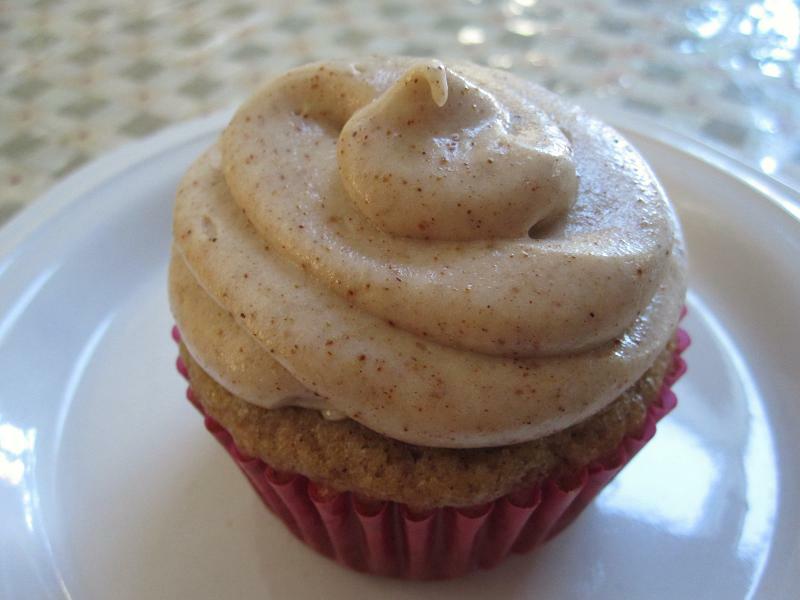 For cupcakes: In a large bowl, sift cake flour, baking powder, baking soda, salt, cinnamon, and nutmeg. Set aside. Using a stand or hand mixer, cream butter, white sugar, and brown sugar until light and fluffy. Add eggs, one at a time, beating until completely incorporated before moving on. Add vanilla. Alternately add the flour mixture followed by the buttermilk in 3 and 2 additions respectively, mixing until well combined. Do not overbeat. When mixed, divide evenly among cupcake liners, each about 2/3 to 3/4 filled. Pop in the oven for 18-22 minutes, or until a toothpick comes out clean. Once done, cool on wire racks. While the cupcakes are baking, prepare the filling and frosting. For filling: Mix all ingredients in a small bowl and set aside. For frosting: With a stand or hand mixer, beat cream cheese and butter until smooth. Slowly add powdered sugar and beat until creamy and smooth. Then add vanilla, ground ginger, cinnamon, and cloves and mix just until combined. Taste and adjust flavorings as needed. To assemble: When the cupcakes are cooled, cut out tiny cones from the top of each one. Cut off the very tip of each cone to give a little more space for filling. Drop about 1 tbsp filling per cupcake. You should have just enough filling. Replace the cone and frost with the cream cheese mixture. For these I put the frosting in a gallon-sized plastic bag, cut off the tip, and piped the frosting on. PS. Is anyone as excited about seeing the Pioneer Woman and Bobby Flay go at it as I am? 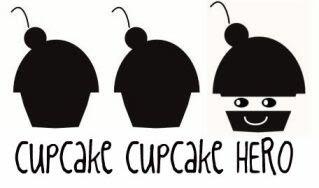 REMINDER: CUPCAKE HERO JULY [COCONUT] ENTRIES DUE JULY 17TH!! Email me at smalltownoven[at]gmail[dot]com! No flour. No baking powder. No baking soda. Sugar but only in the form of packets. You’re actually in the studio I’m staying in for the month. Such a place exists? you may ask. And my answer would be Sad, but true. So what is a girl to do when she yearns to bake all day every day but has an empty kitchen smaller than her closet at home?? I racked my brain for ideas on how I could get my fix. And I though PUDDING! What a fantastic idea! I needed to buy a few ingredients, yes, but not nearly as many as if I were to make cookies, cupcakes, etc which were all first on my list. So here I am with pudding. And oreos. Because for some reason I’m obsessed with oreos these days. No lectures on how obscenely unhealthy they are for you please. 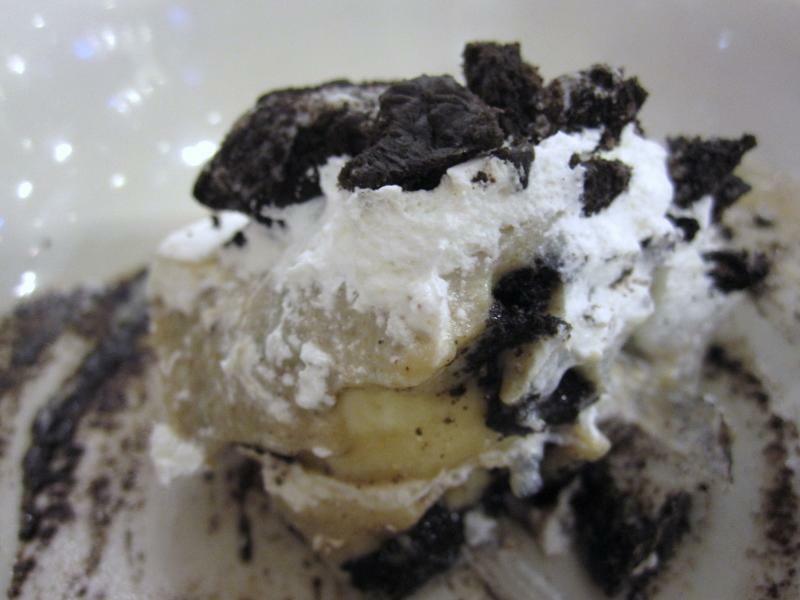 If you’ve ever had dirt pudding, it’s usually made with vanilla pudding, whipped topping, and oreos. I decided to make it a cinnamon pudding and add in some bananas to make it a little fancier. Can I tell you? This version of dirt pudding is delicious. The cinnamon pudding itself is unbelievable and could very well stand on its own but add it to some oreos, bananas, and whipped topping? Good gravy we have a winner! If you’re low on flour, or even if you’re not, let me introduce you to my friend Cinnamon Banana Dirt Pudding. BEST friend, in fact. Whisk the sugar and cornstarch together in a medium saucepan. Slowly whisk in the milk. Then add the yolks and cinnamon stick. Bring mixture to boil over medium-high heat, stirring constantly with whisk, approximately 7-8 minutes. Lower the heat to medium and cook, whisking constantly 1 to 2 minutes, until pudding is thick. Remove the pan from the stove. Strain the pudding into a medium bowl. Add the cinnamon and whisk until the cinnamon is completely mixed in. Discard the cinnamon stick. Leave the pudding on the counter for 30 minutes, until lukewarm then place in the refrigerator to completely cool down. 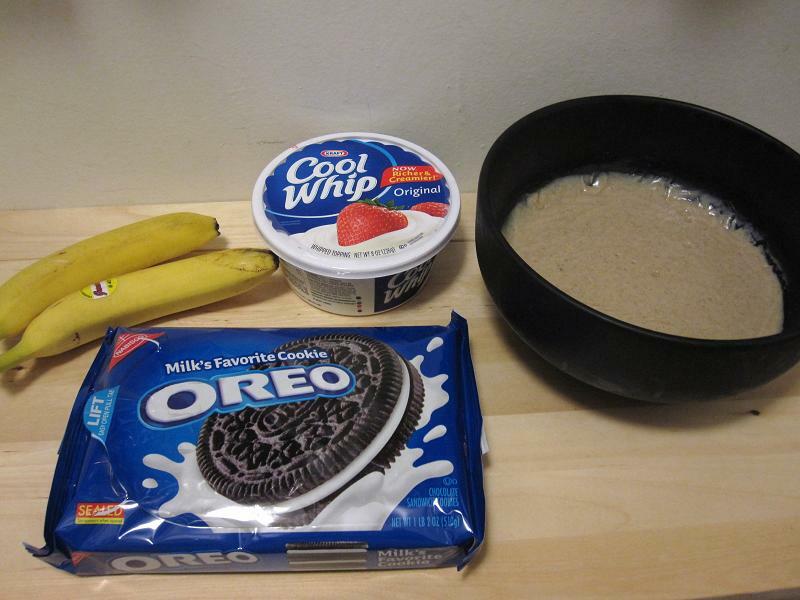 Crush oreos in a plastic bag with a rolling pin, frying pan, etc. Set aside. Slice bananas however thickness desired. Set aside. In a serving container (I used an 8×8 brownie pan because it’s all I could find) layer the oreos, pudding, whipped topping, and bananas. 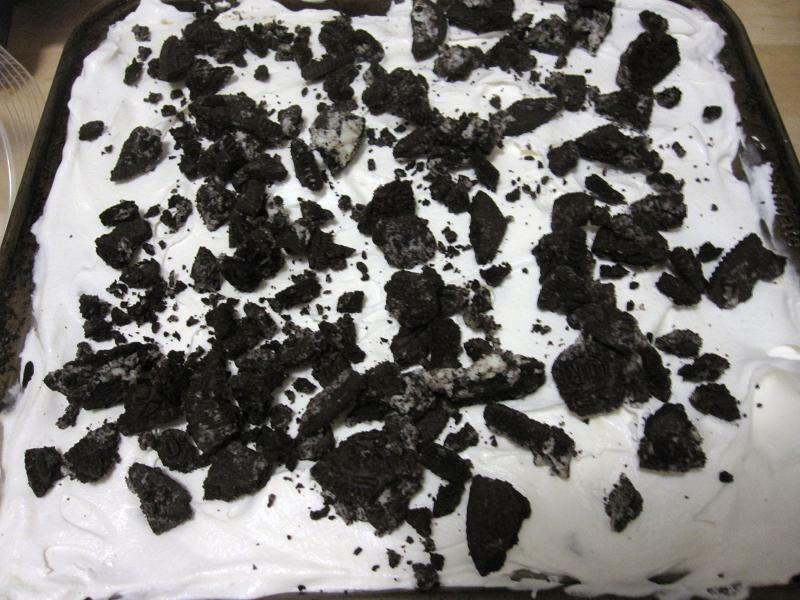 Continue layering with oreos, pudding, whipped topping, and finish with oreos, reserving a handful or two. I only did one layer of bananas. It’s up to you. Chill for several hours before serving to allow oreos to soften. Just before serving, top with remaining crushed cookies for a little crunch. Lent. It’s a period of reflection, devotion, sacrifice, and non-chocolate goods. Why, you ask? Every year my mom gives up chocolate for the season and every year she makes it through unscathed. The task used to be much more difficult. When I was younger, chocolate wasn’t even in sight and we’d all have to be careful about sneaking some here and there so as not to make her long to share in our chocolate-covered happiness. Nowadays, we eat chocolate in front of her without fear of repercussion and even consume entire boxes of chocolate goods without saving any for her to have later. Mean, I know, but COME ON. Can’t let good chocolate just sit there. When I bake, however, I always want my Mom to be able to share. Unfortunately I’ve been on a chocolate kick lately so picking out a non-chocolate recipe was a bit difficult. 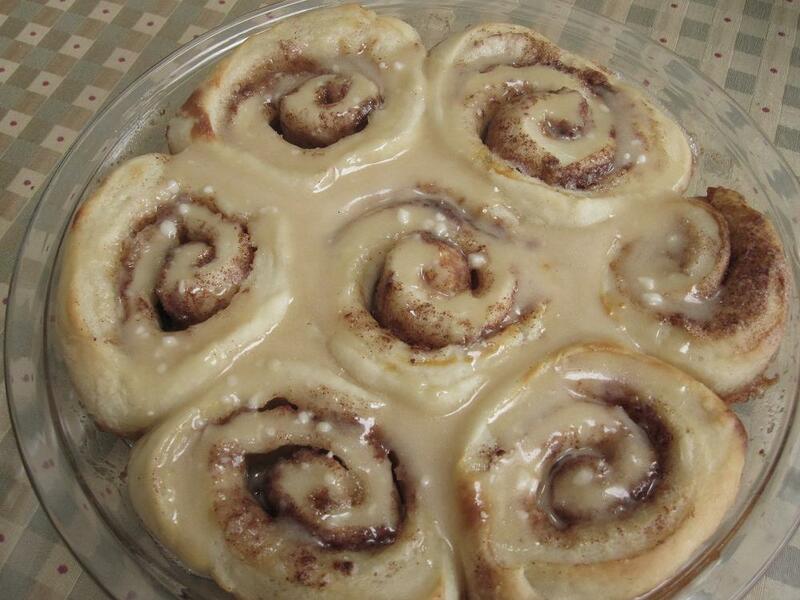 Difficult, that is, until Pioneer Woman showed up with these cinnamon rolls. Goodbye Cinnabon, HELLOOOOOOOO PIONEER WOMAN! These rolls were uh-may-zing. My brother said, “This is the most cinnamon-y roll I’ve ever had. 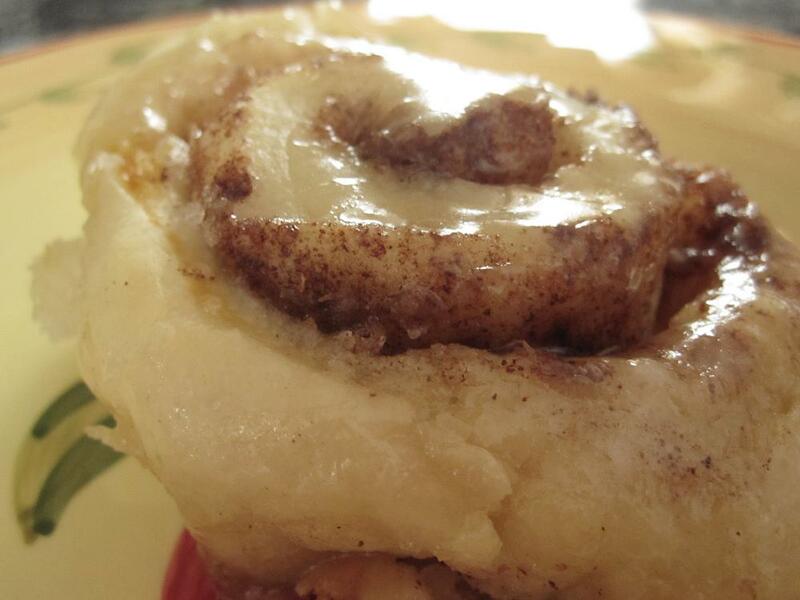 Usually cinnamon rolls are sugary. This one is cinnamon-y. And.. buttery.” Pretty accurate analysis. He did, however, leave out that fact that they’re completely melt-in-your-mouth satisfying and while you’ll feel guilty reaching for a fourth second helping you won’t feel that guilty because they’re that good. 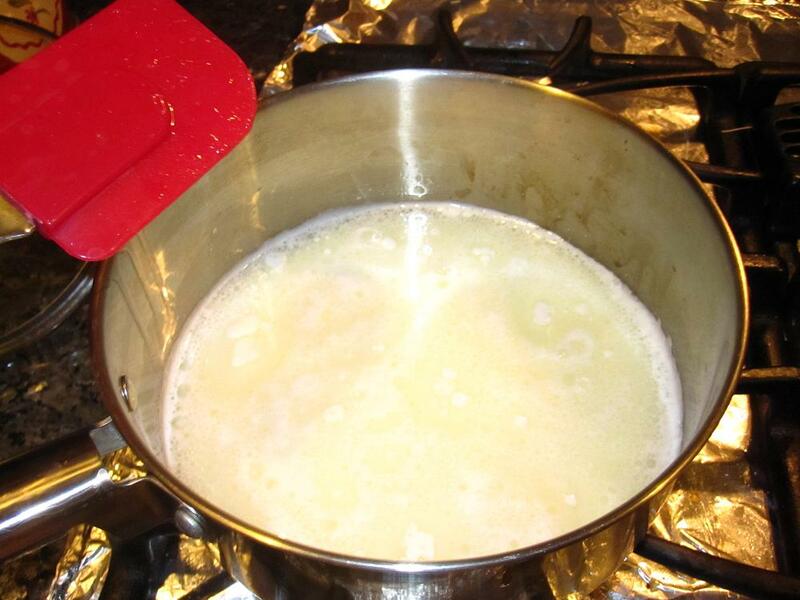 Mix the milk, vegetable oil and sugar in a medium saucepan. Heat until just before the boiling point then turn off heat and leave to cool 45 minutes to 1 hour or until lukewarm. Sprinkle in yeast and let sit for a minute. Add 4 cups of all-purpose flour, stir, and cover with a towel to let rise for at least an hour. Sprinkle rolling surface generously with flour. 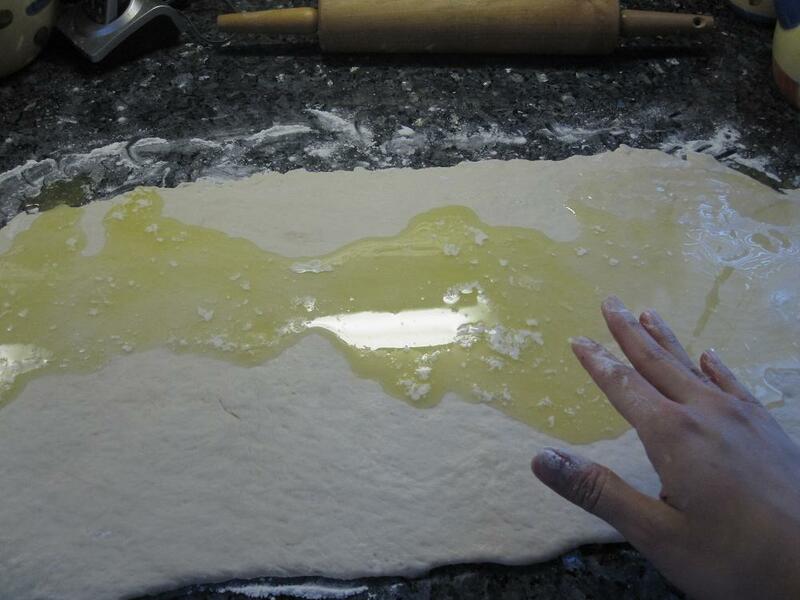 Form a rough rectangle by hand with dough (if using full recipe, work with dough in halves). 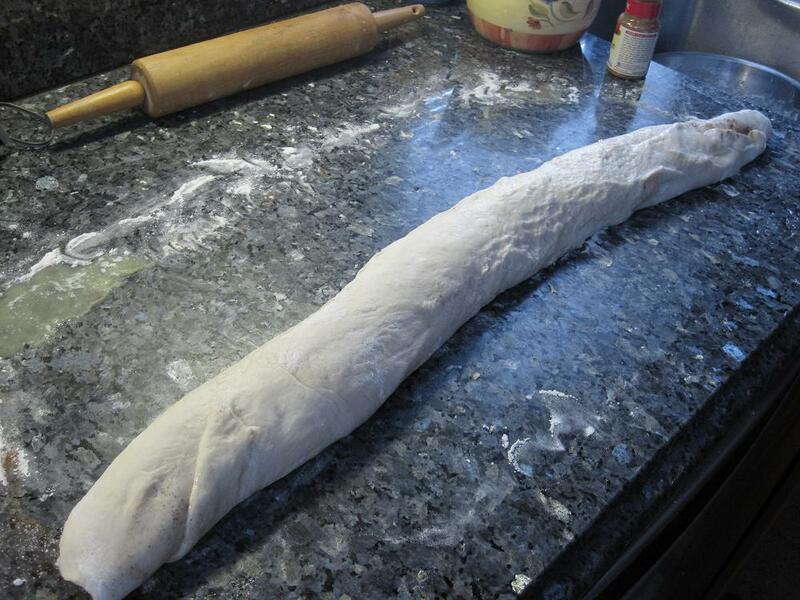 Then using a rolling pin, roll into a thin rectangle. Drizzle melted butter over the dough. [This will be messy!] 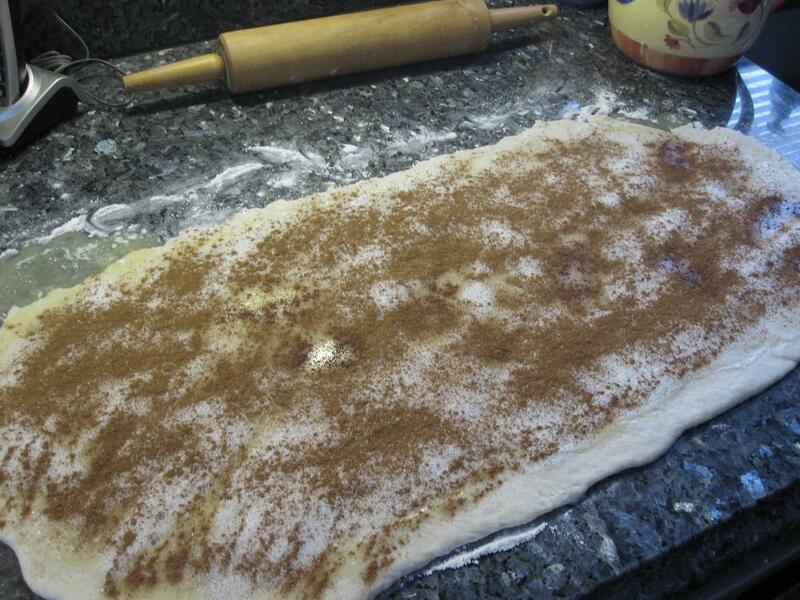 Then sprinkle sugar and cinnamon over dough. 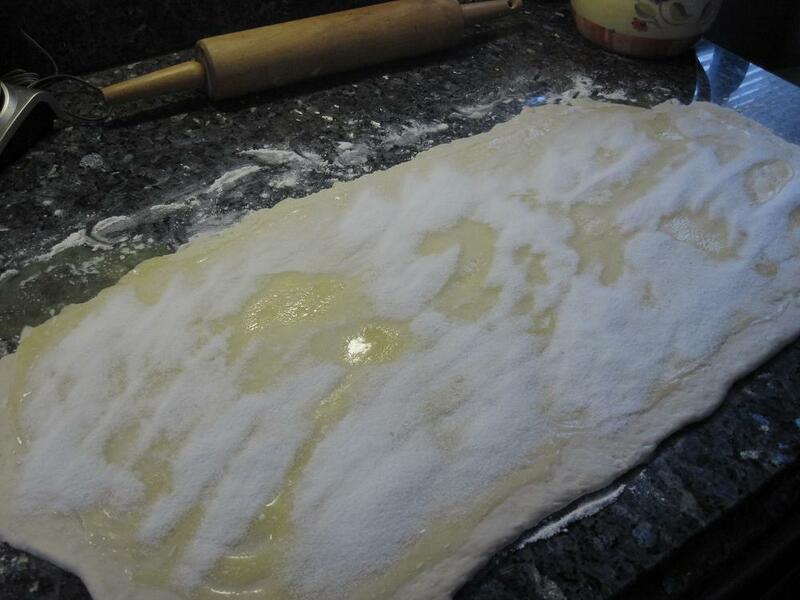 Now, starting at the opposite end, begin rolling the dough in a neat line toward you. Keep the roll relatively tight as you go. Pinch the seam of the roll to seal it. Cut the rolls approximately 3/4 to 1 inch thick and lay in buttered pie pans. Let the rolls rise for 20 to 30 minutes, then bake at 375 degrees for aluminum or 350 for glass pans until light golden brown, about 15 to 18 minutes [mine took 16]. Absolutely perfect on a cold winter day. Or anytime you get around to making them.